i bought the Mercedes alloy wheels last year. They weren’t my first choice, I wasn’t really sold on the flat face look. But the price was right ($100 for 4) and I thought the offset of 25 might work out for me. 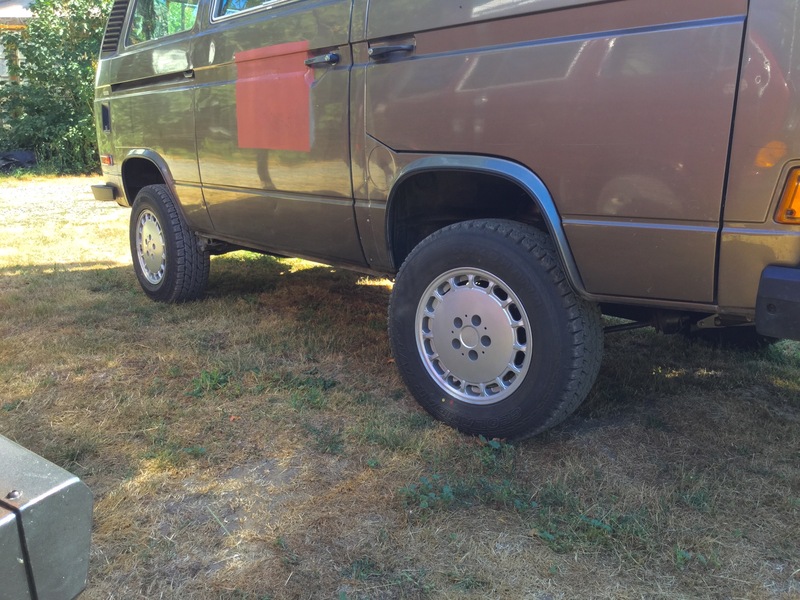 The ideal offset would have been 30mm, but folks have successfully used ( without wheel spacers) wheels with offset of 37mm on the syncro. Mind you I think those wheels were narrower than 7″. The whole subject of wheel choice can be confusing. Chris at T3 Technique has good information (link) and there is a very lengthy Samba thread on the topic. With the alloys having an offset of 25mm I wasn’t concerned about clearance issues with suspension components but I was a little nervous about how much space there would be between the sliding door and the passenger side rear tire. 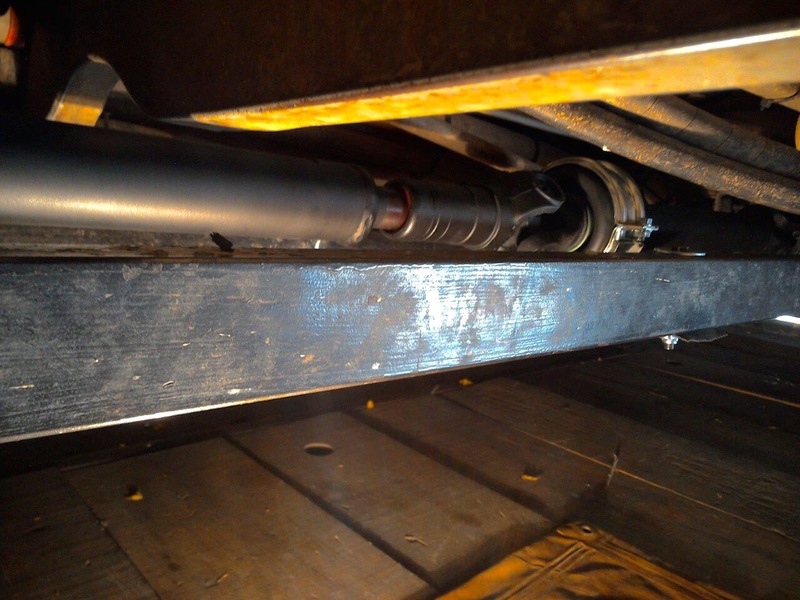 As it turned out there is a good 3/8″ – 1/2″ space between tire and door. Some time after I bought the alloys, good friend Simon bought a set of Mercedes 15″ steel wheels. 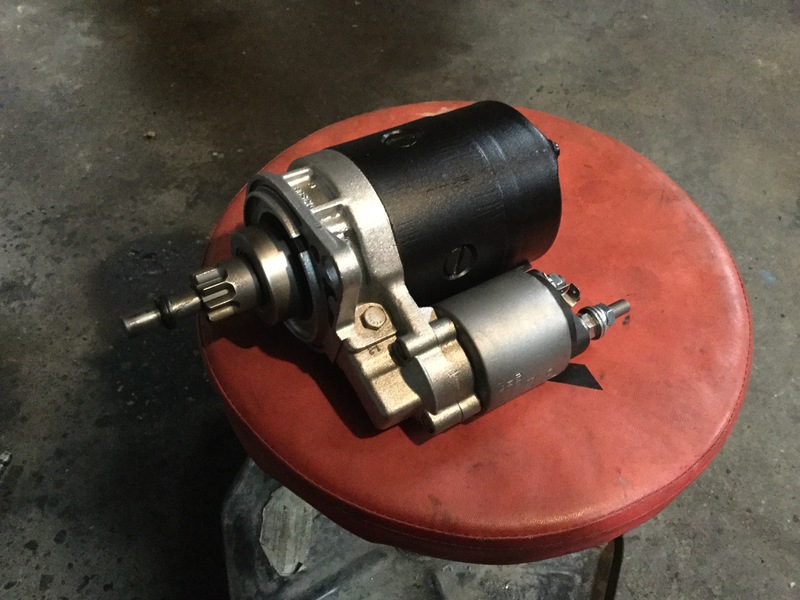 6.5″ wide, offset of 37mm. 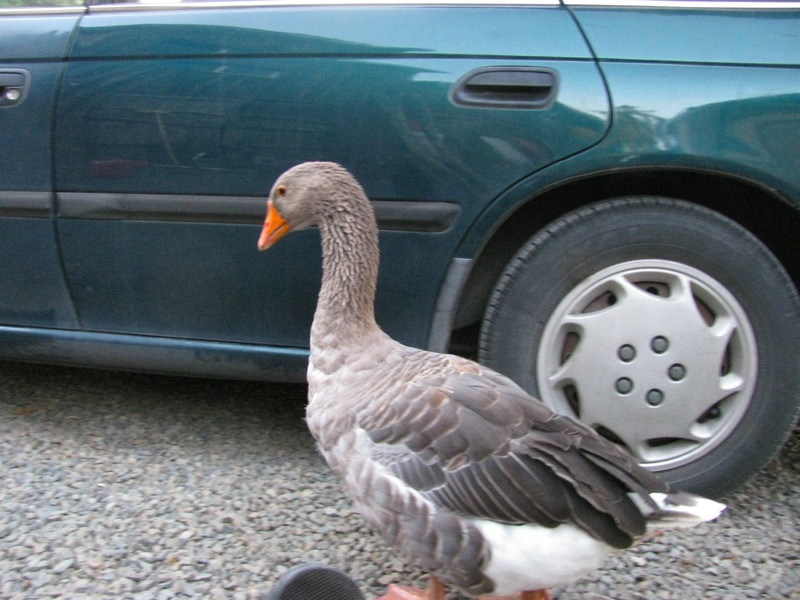 He offered them to me, we thought that maybe the black steel wheel look would work on my van. If they did both of us would use one of the alloys as a spare, if not then the steelies would be out spare. Simon needs a better rin for his spare. I had one of each type mounted with tire and compared them on the van. The alloys won. 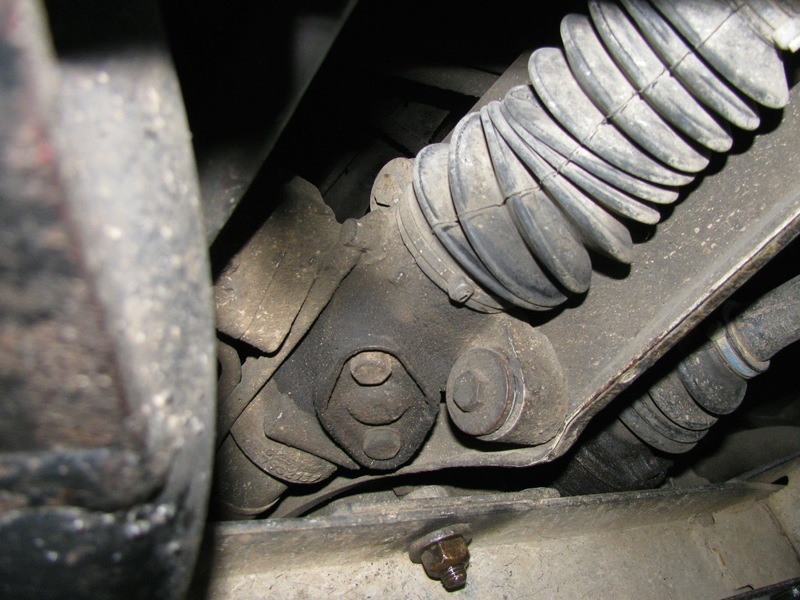 The clearance between the steel wheel and both the front and rear suspension components was tighter than the alloy. As the alloy wheels have a thicker cross section where the wheel studs locate I had to get longer studs. Well on the rear wheels anyway. The studs are a tad longer on the front wheels so I left them stock. I measured and determined I had 8.75 turns on the lug nut on the stud as it tightens up to the wheel. The thread size is M14X1.5 so that gives 13.13mm of engagement which I think is sufficient . 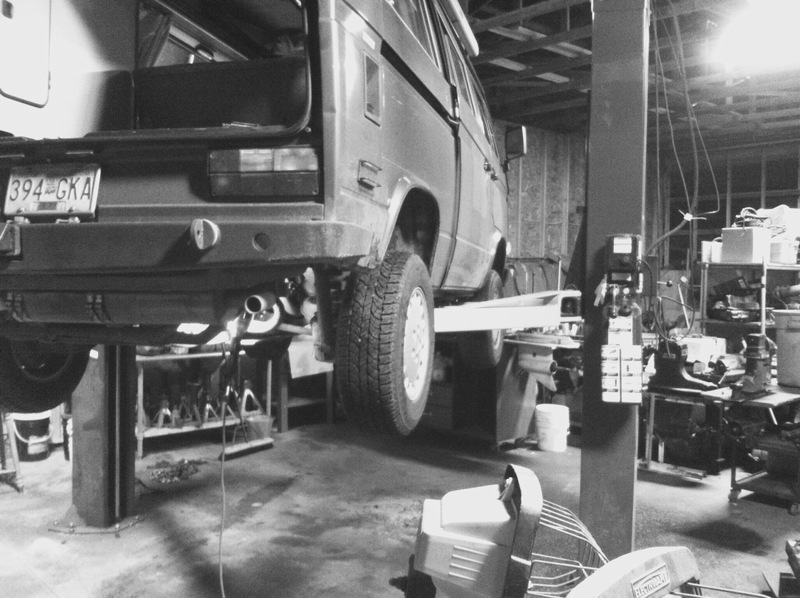 Replacing the front studs on the syncro is a pain. 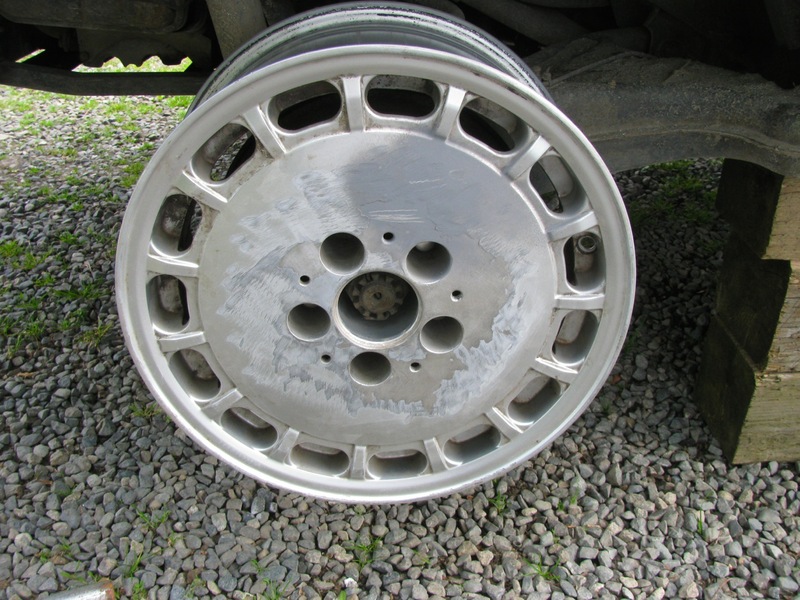 Note that various alloy wheels differ in thickness in this area, some are quite thick. I got the longer studs from Chris at T3 Technique, hands down the best source for wheel hardware. I had a spare set of rear hubs so I had the studs pressed in, sitting around waiting until I got off my duff. Also, the lug nut seats on the Mercedes alloys were the small ball type, the stock steel wheels on the Vanagon use large ball seats. So I had to buy some new lug nuts and yes I got them from T3 Technique. 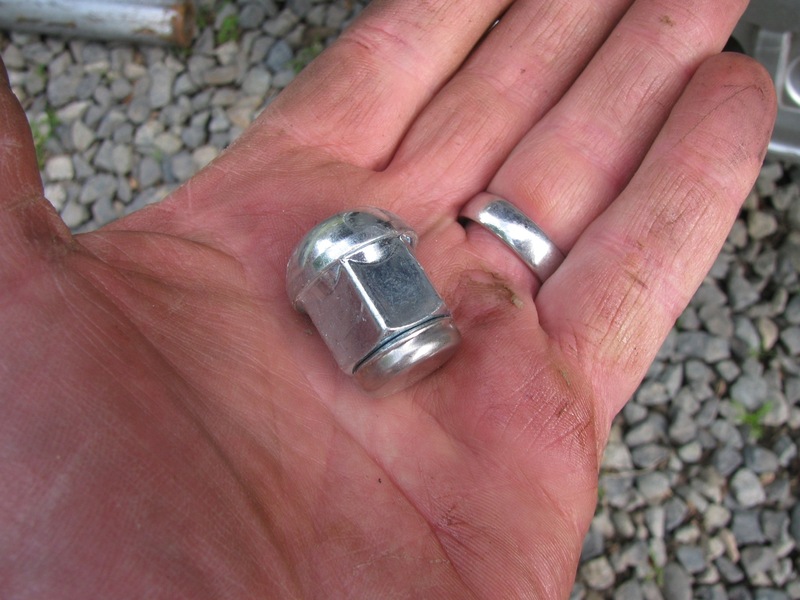 Here is a pic comparing the stock Vanagon lug nut to the lug stud that came with the alloy wheels. And one more thing to do. The Mercedes alloys are drilled for 12mm studs. 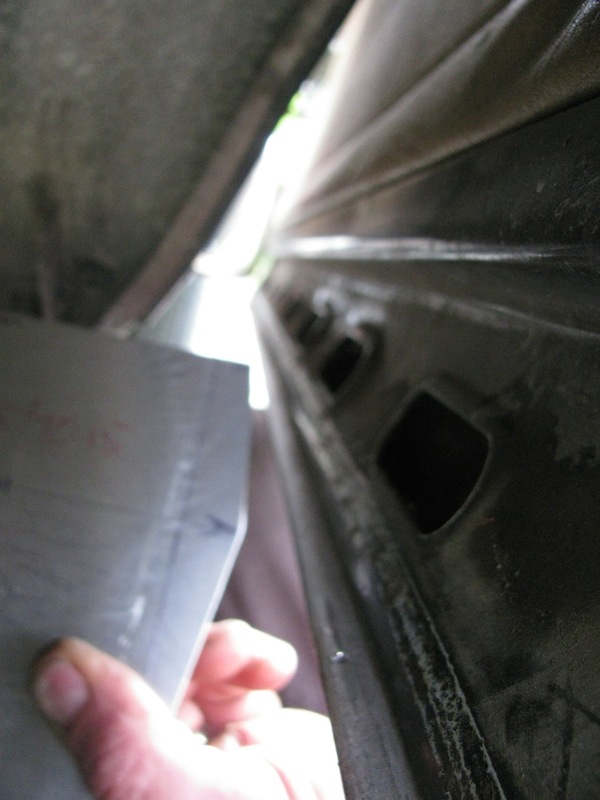 The Vanagon uses 14mm studs. 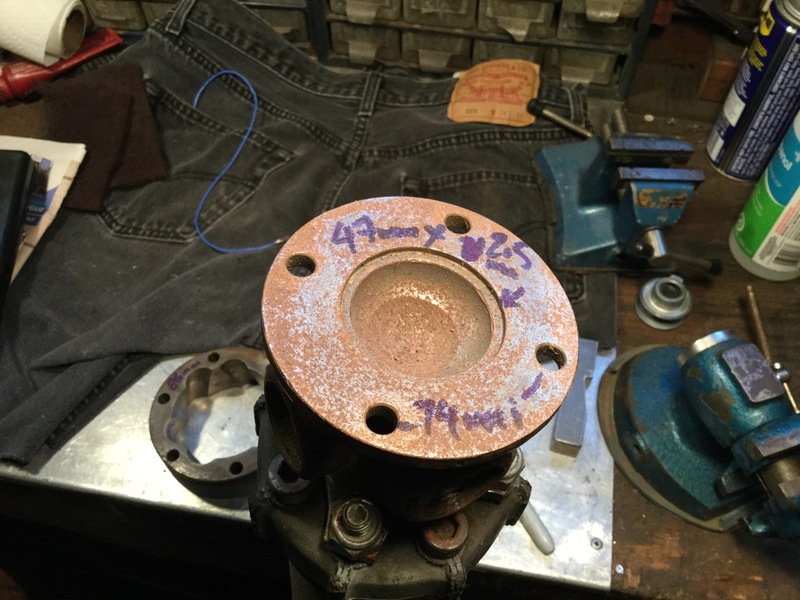 I enlarged the holes with a 37/64″ drill. I had a bit of fun getting the hubs off the van. 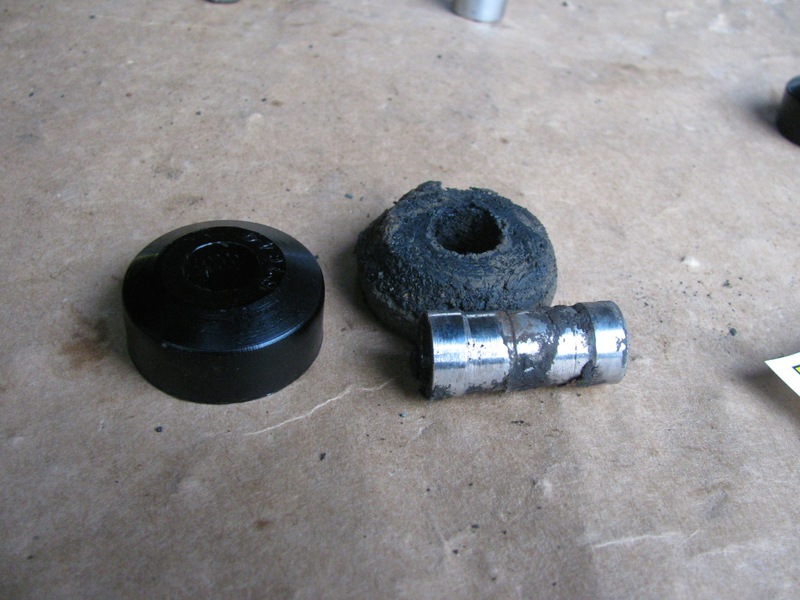 I’ve done this job a few times but this time the big 46mm axle nuts were very, very reluctant to come off. 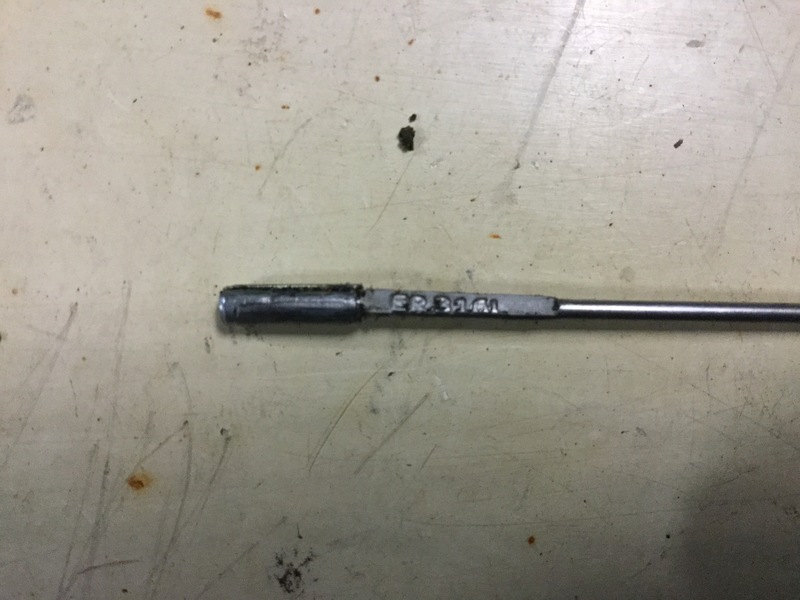 What I normall use is a 1 13/16 socket, 3/4″ drive but for the life of me I couldn’t find the 3/4″ extension and T bar for the socket. 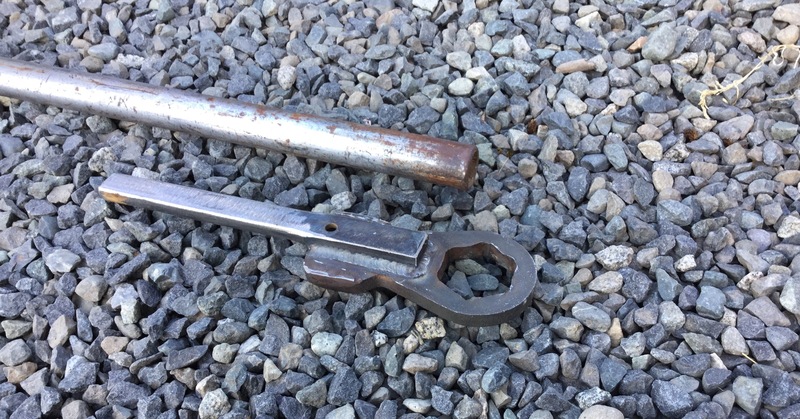 So I thought I’d be clever and modify the 46mm slugging wrench I had. 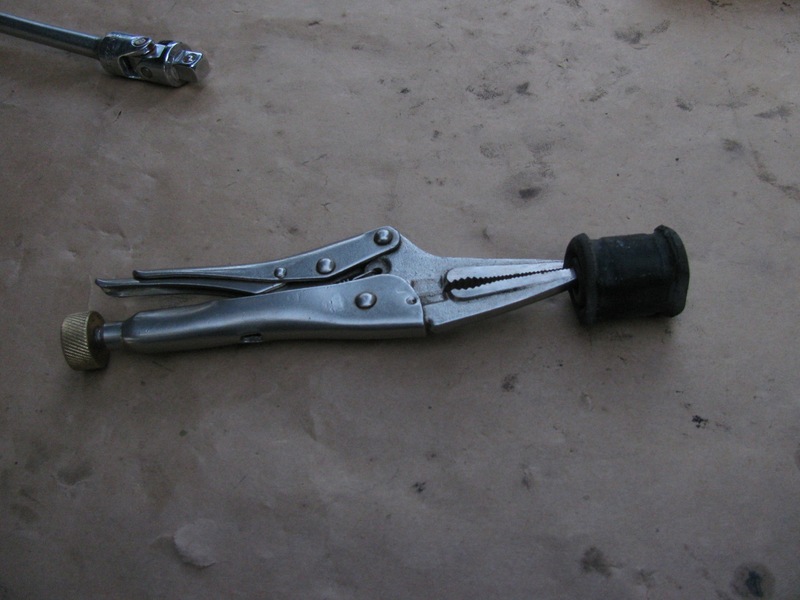 Btw, I have a hard time using the slugging wrench in the way it is supposed to be used. I find it hard to get a good swing at it with the heavy hammer without hitting the wheel. 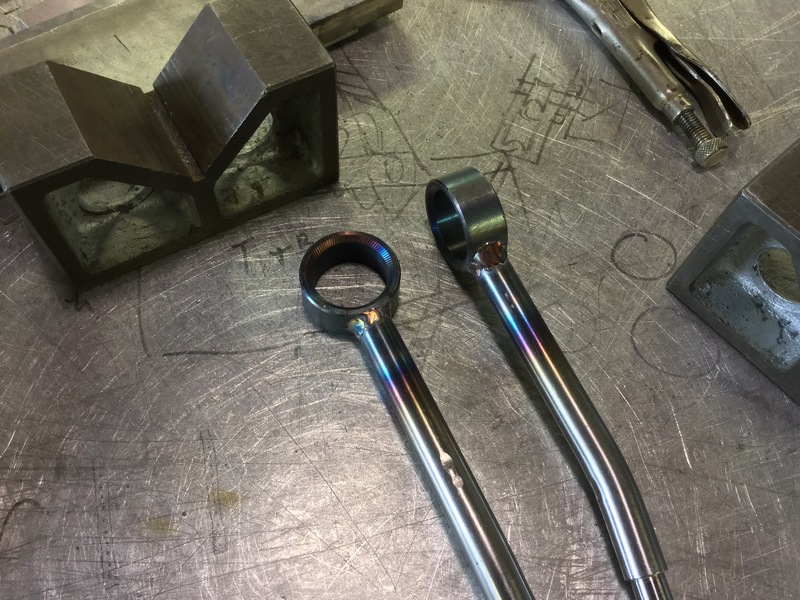 I welded a bit of 7/8 hot rolled steel to the wrench, and that spud fit into the 5′ steel tube I use as my might extension. Well, the hot rolled bent immediately. 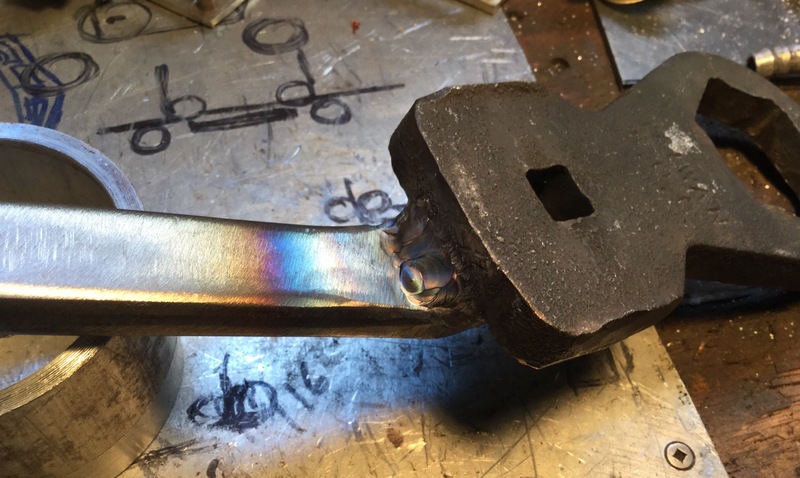 Ok, I cut it off and welded on a found section of bar stock. 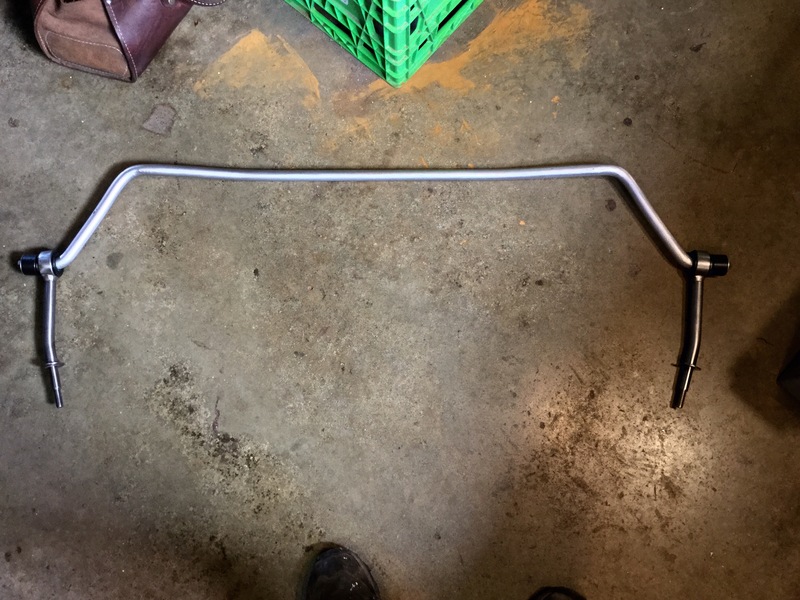 I had the notion that this particular bar stock was perhaps a stronger steel. 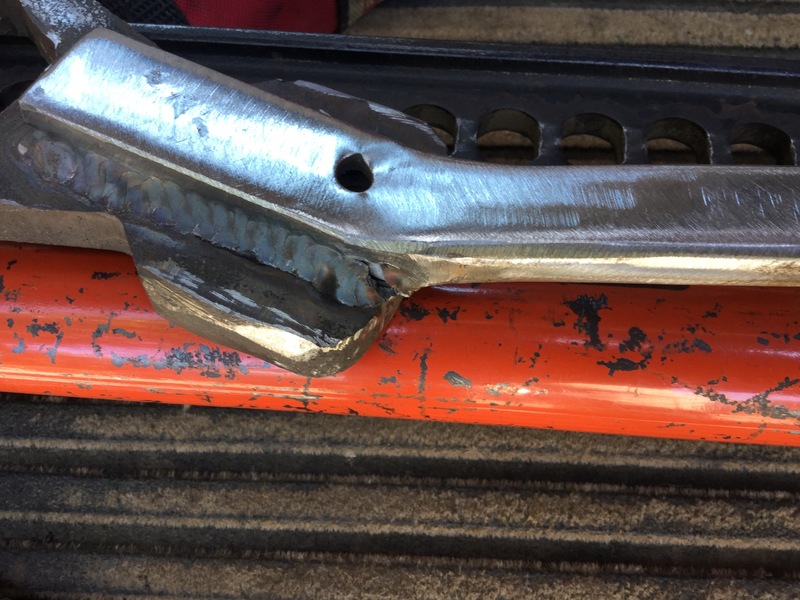 Why the heck did I weld it on with the hole at that end? I can’t explain this bozo move. 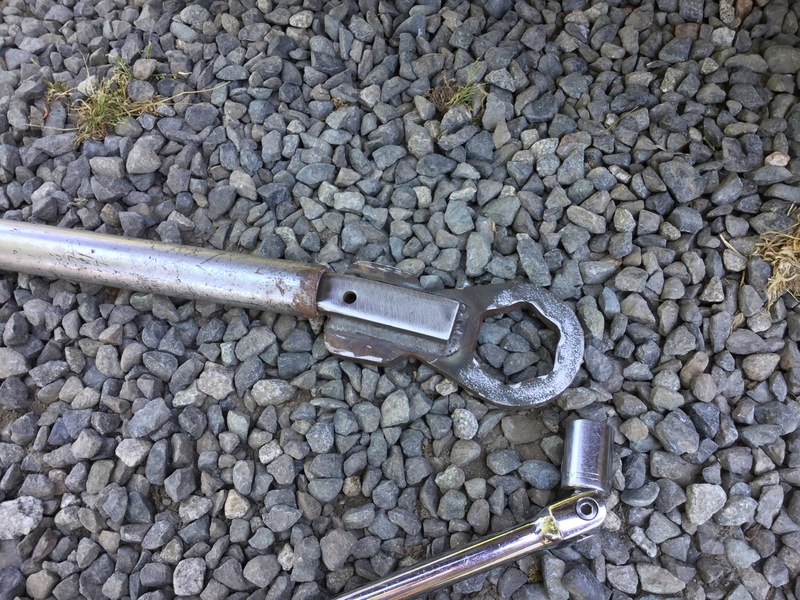 Well that shifted the rig hand side axle nut, but it bent a little in the process. 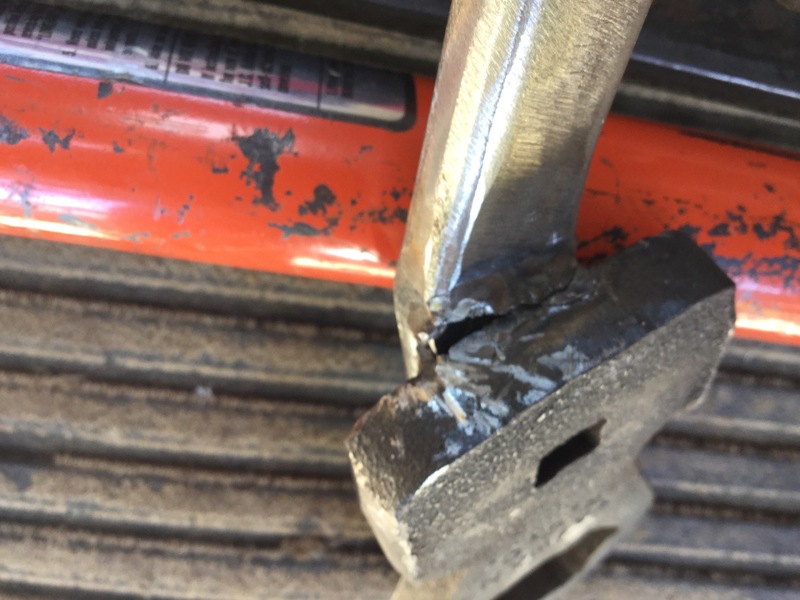 But Mr Wrench (and my weld at the end) was not up to going after the other side. 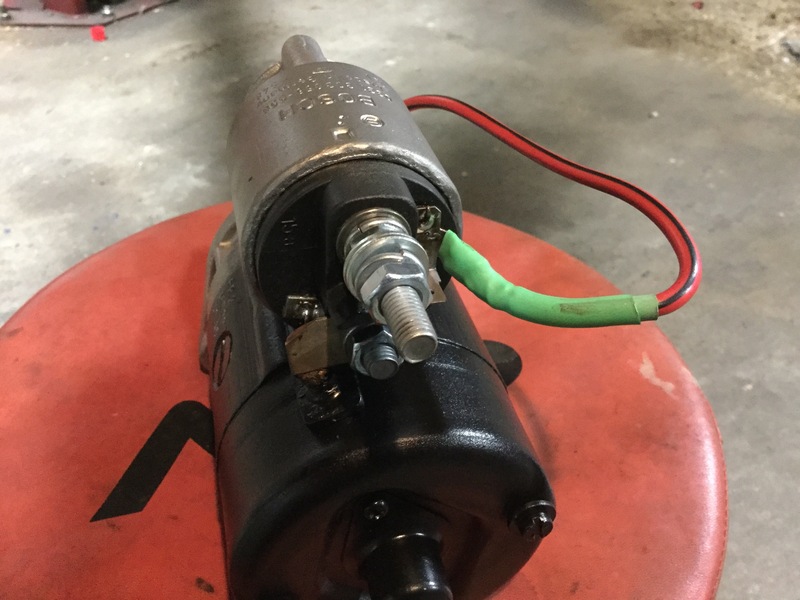 I nipped over to a friend’s shop and he easily loosened the nut with his Milwaukee battery powered impact gun ( has 1100 ft lbs of torque). 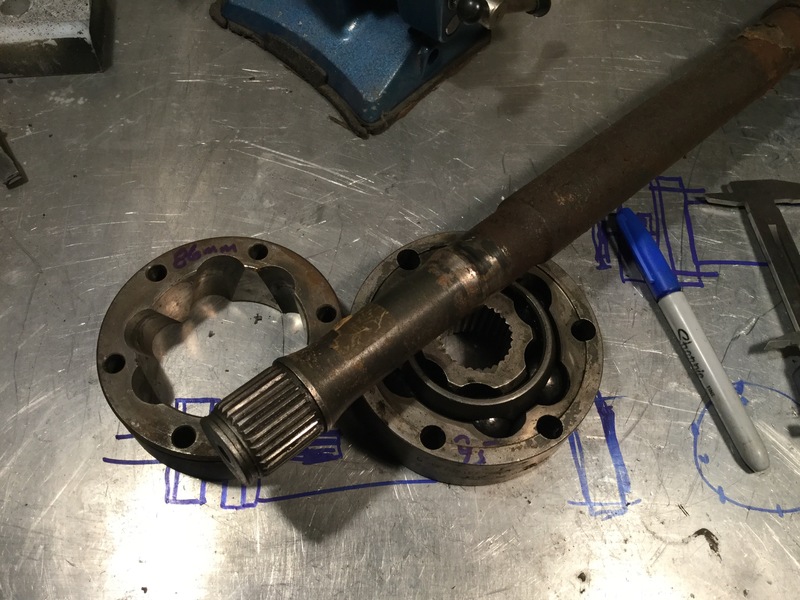 Mr Wrench was still strong enough to re-torque the nut to the 365 ft lbs the bugger needs. I added a bit more weld in the hope that I can use him again sometime, in his new cranked conformation. I’ve yet to get some good shots of how the wheels and tires look on the van. In the meantime here are some quick snaps of my van and good friend Simon’s van. Simon has South African Carat (?) alloys and Nokian WRC 205/70-15. 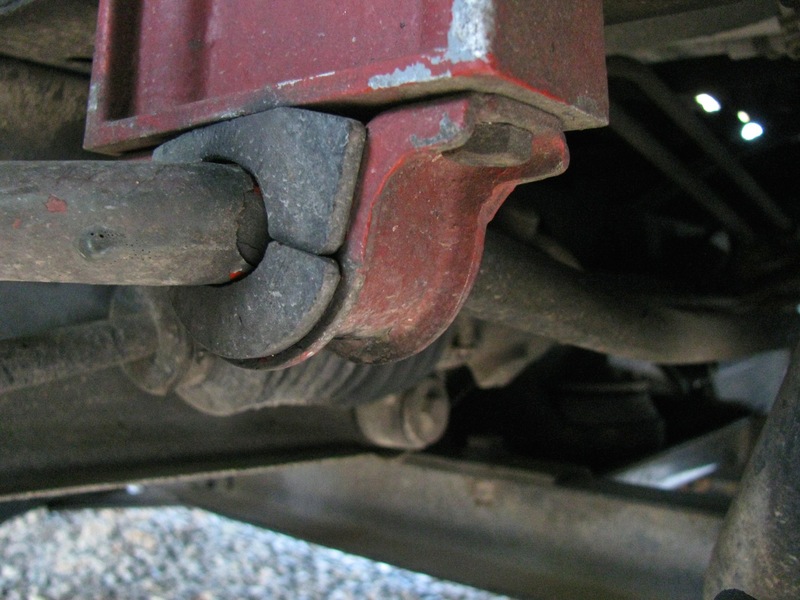 This value of this modification to the sway bar is debatable. But hey, don’t let fear and good judgement hold you back from having a bit of fun. And god knows I’m not going to sit here and tell you this is an original idea, I’m old enough to know that someone somewhere has done this before. 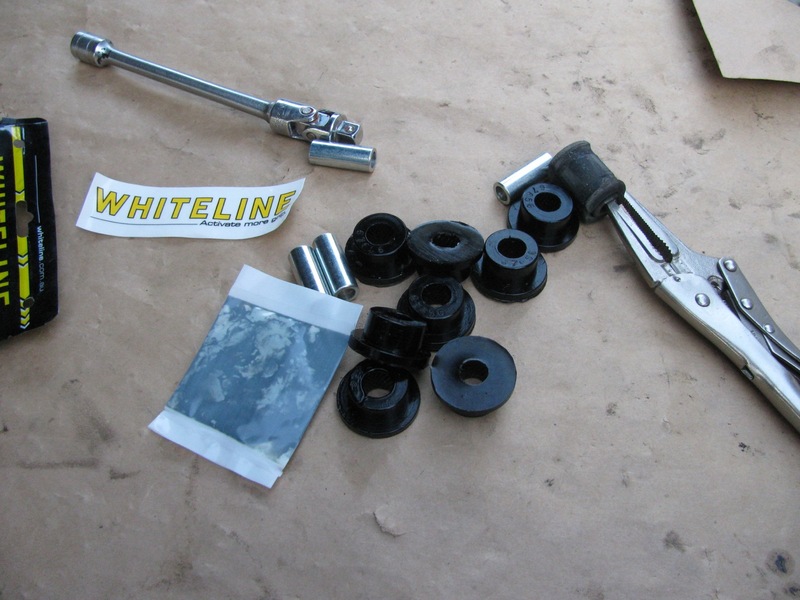 I didn’t look forward to installing the sway bar drop links with Whiteline polyU bushing. 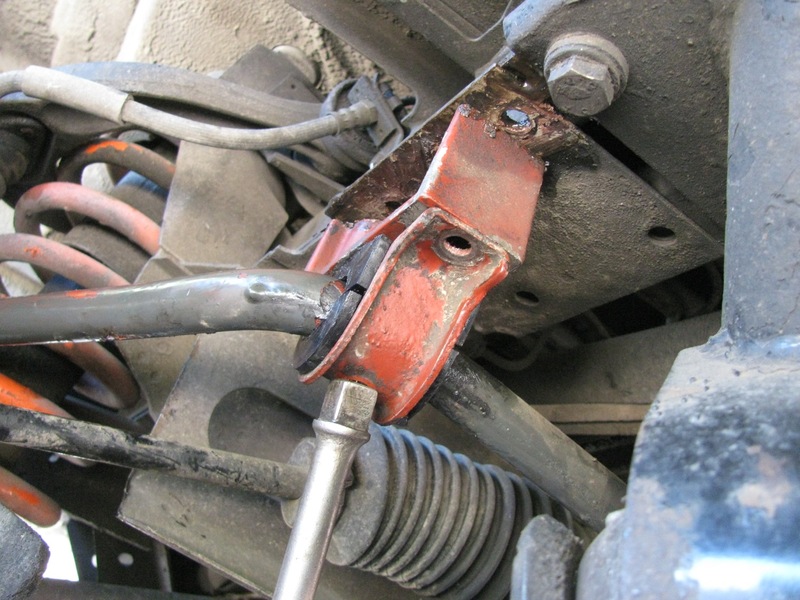 It can be a bit of a struggle getting the drop link onto the sway bar. Mind you, Chris at T3 Techiniques makes it look easy in his video. 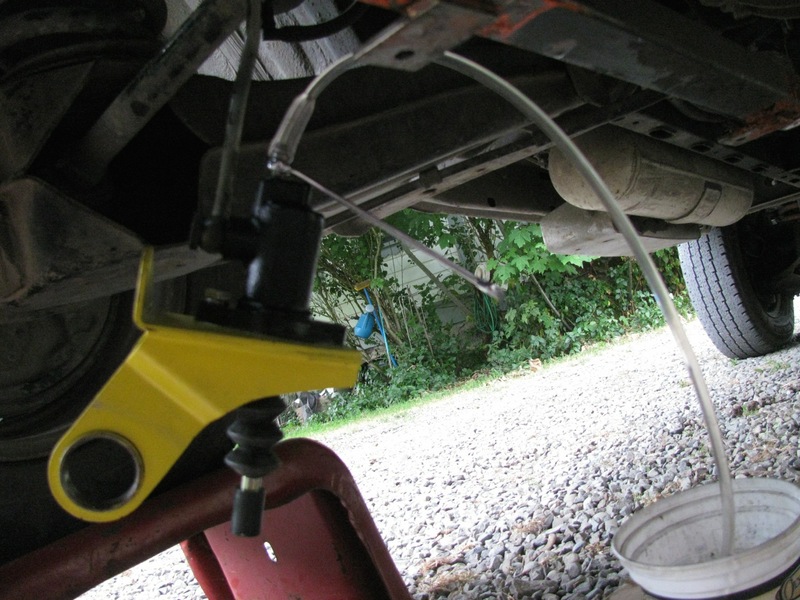 By the way, T3 Technique is a place to buy polyurethane bushings and other suspension parts. 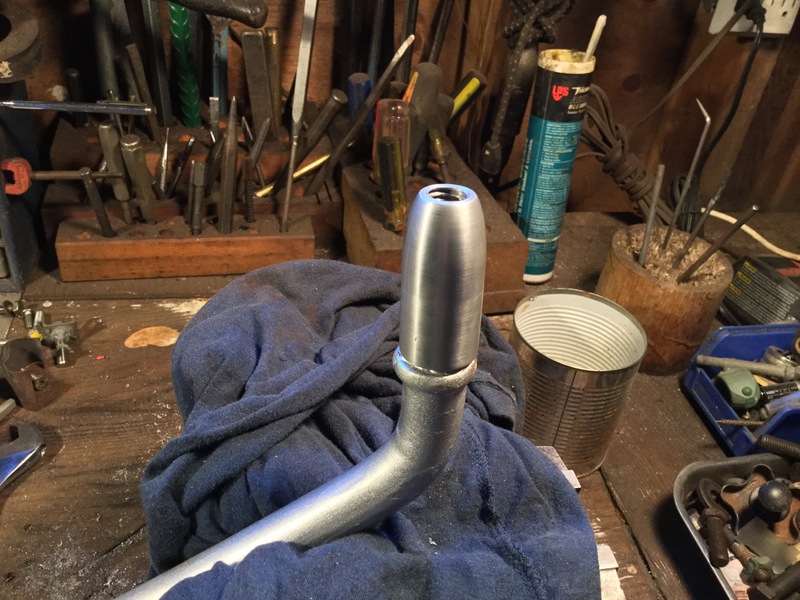 I had thought about the notion of cutting the knob end off the sway bar then drill and tap a hole so a thick washer could be attached to replace the knob. But I didn’t like that idea for a few reasons. 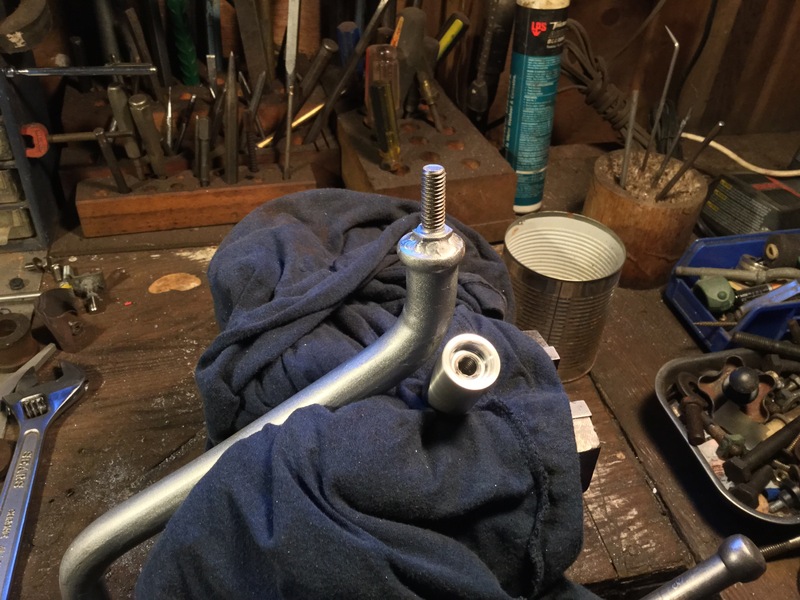 So what I did do was this, I welded a 3/8″ stainless steel bolt to the end of the sway bar. 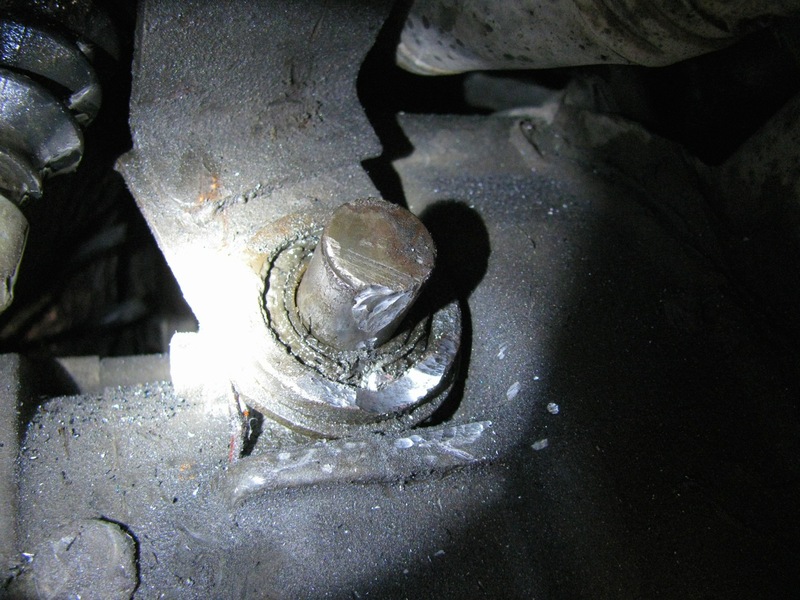 Well I should say sploodge welded the bolt on, not pretty. So what eh? 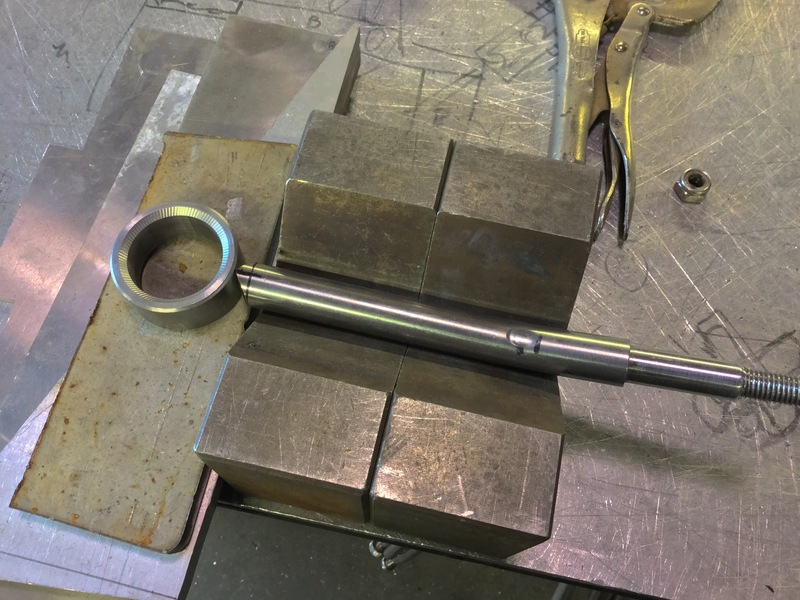 Well now I made a bullet shaped tool, tapped for the 3/8″ bolt on the blunt end and tapped for 1/2 NC on the pointy end. i made a Delrin cap to fit over the exposed bolt. 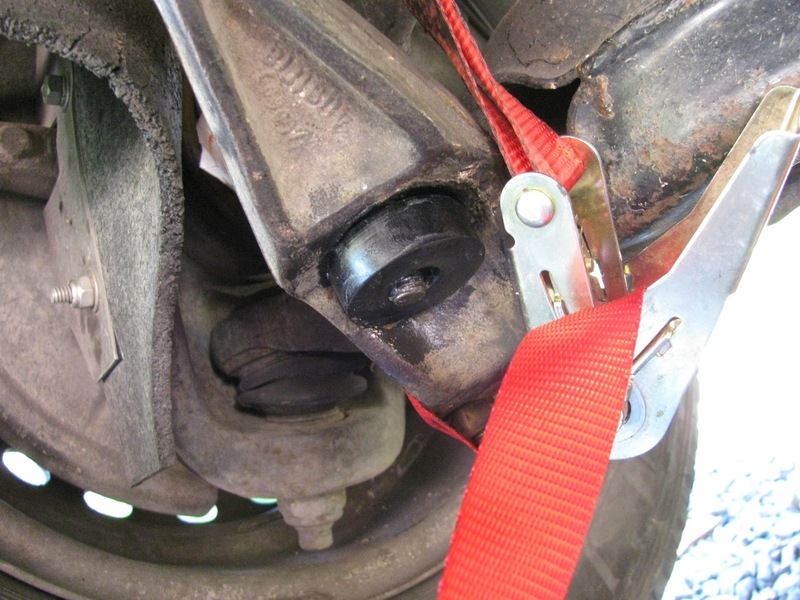 Tidies things up and may help to prevent the drop link coming off the end of the sway bar. 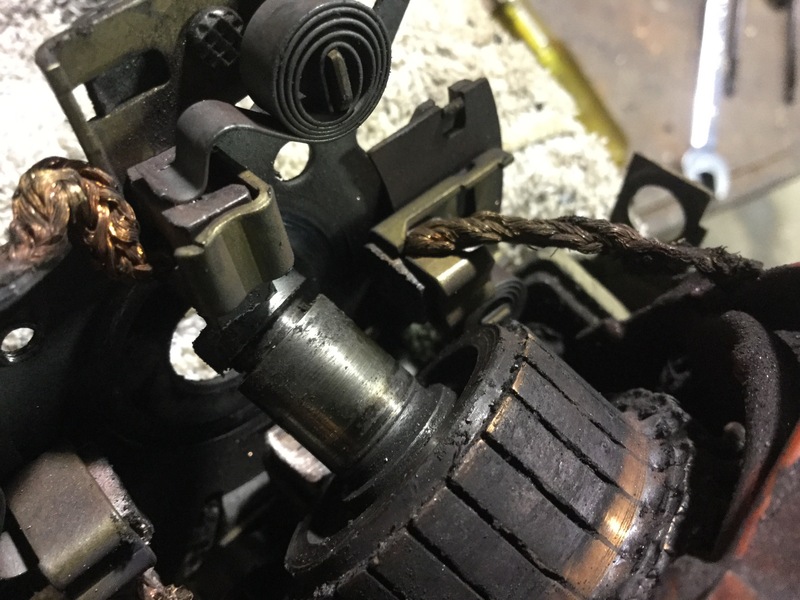 This has happend with the softer urethane Powerflex bushings, maybe not as likely with the harder Whiteline bushings I have used, but hey, it’s another justification for this mod. 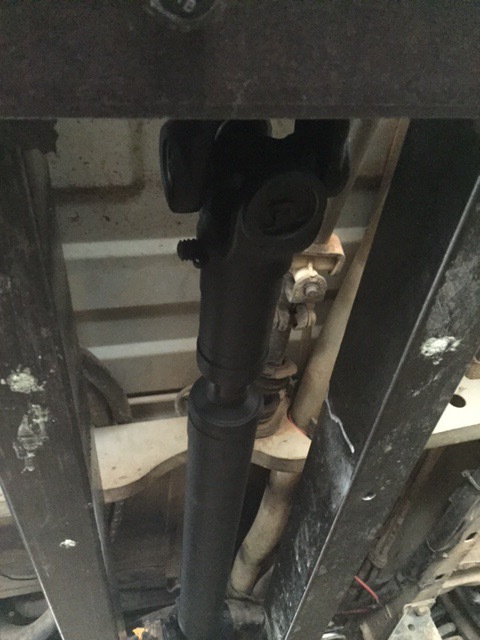 And of course I scraped the heck out of the paint on the sway bar installing it on the van. I guess I should show hey finished drop links. 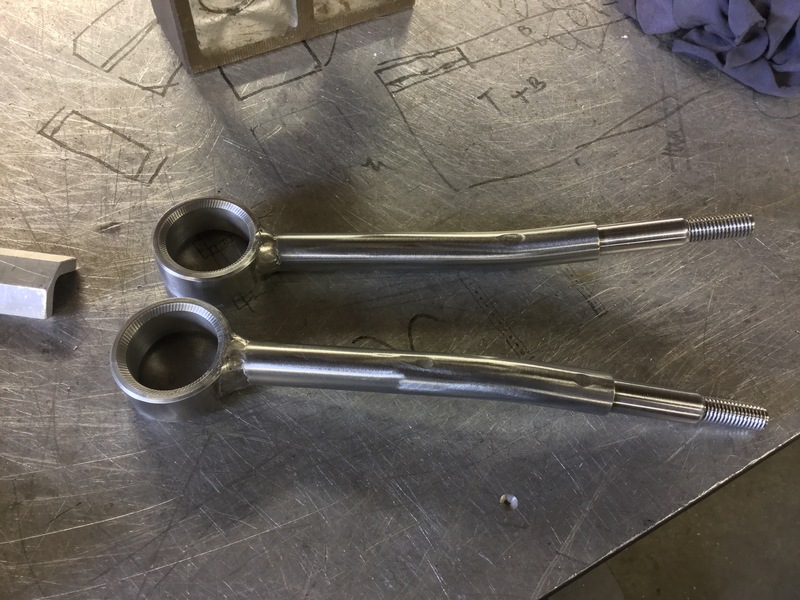 I had machined them a while back, 3/4″ (19 mm) stainless rod and heavy walled ( sorry I forget the wall thickness) tubing which had ID of 1 1/2″ (38mm) very close to to the stock link. 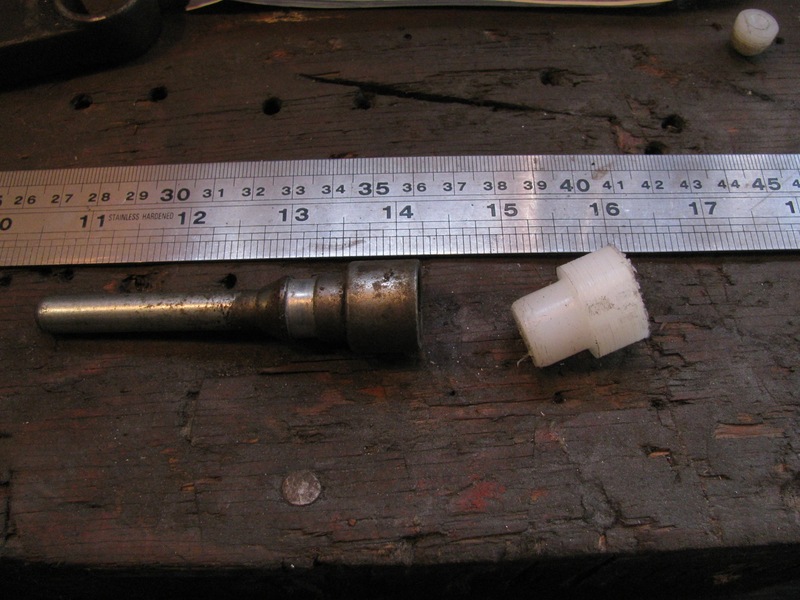 Threaded the end M12X1.5, and a section approximately 17mm in diameter where it passes through the drop link bushings. No spacer in this set up, we’ll see how that works out, but is not an original idea. 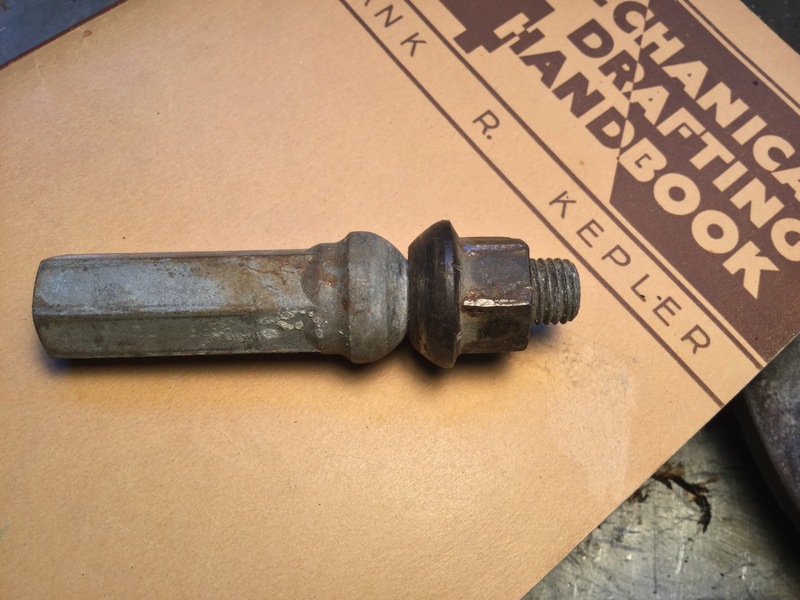 I bent them on a friend’s press using a quickly made set up that does leave some dimples in the bar. I think I took about 8 tons of force to bend them. I was shooting for 4 degree bend, but I went a degree or so more. I don’t think that will be a problem. 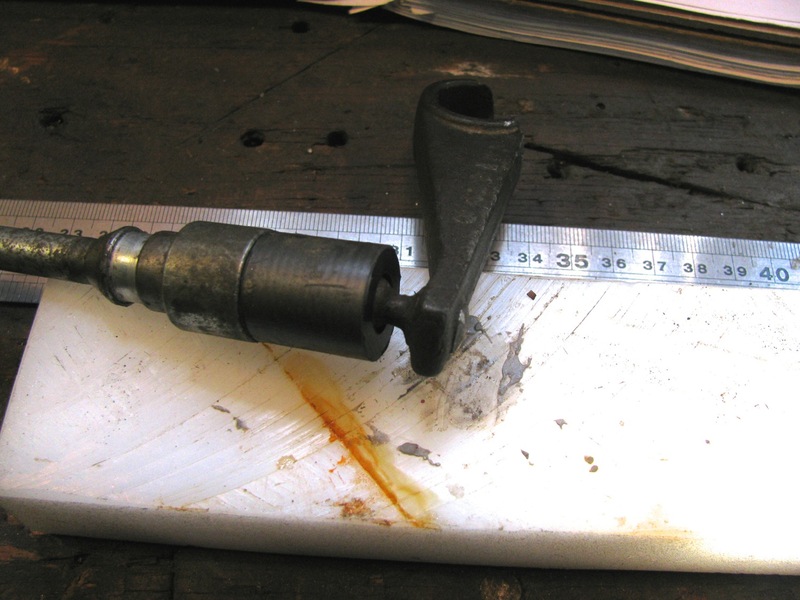 I cut them to length and ground a chisel point on the end. 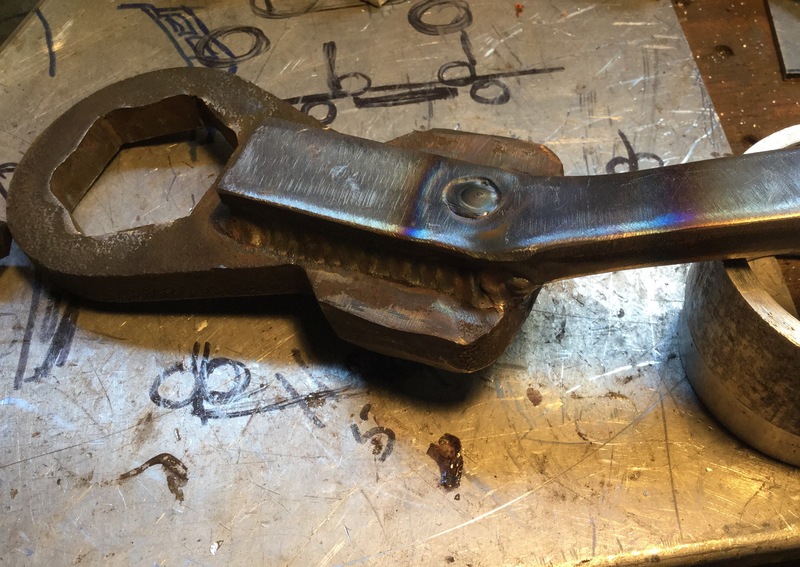 One root pass, then two straddling passes of weld, then I washed over with the torch. 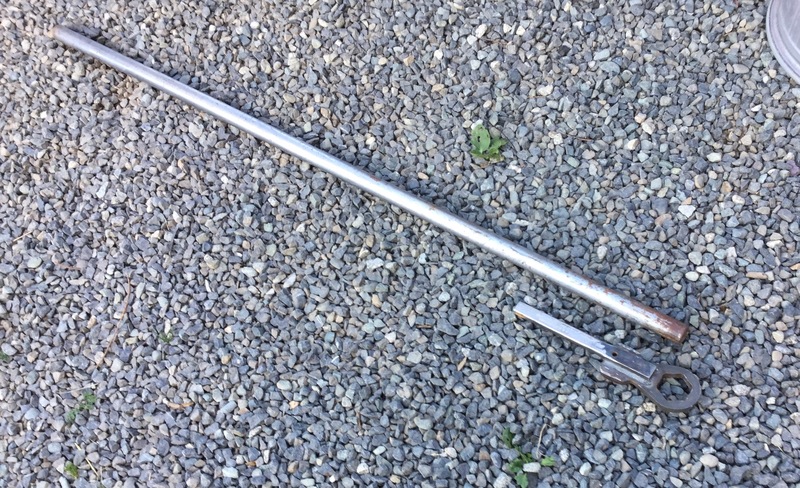 I got a bit of under cut on the rod, I could have done better but it will be strong enough. Notice the pattern on the ring portion, patented “Chattr-Mastr” finish on the bevel. 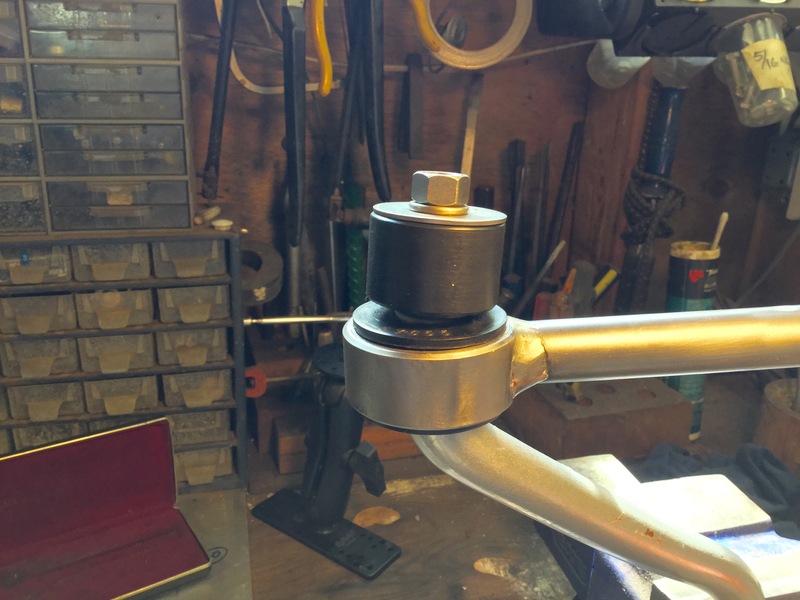 I used the cup washers I made a while back, but welded on a smaller diameter flat washer to the should of the drop link as I was worried that the enlarged hole of the cup washer would get pressed over the shoulder under hard use in the van. 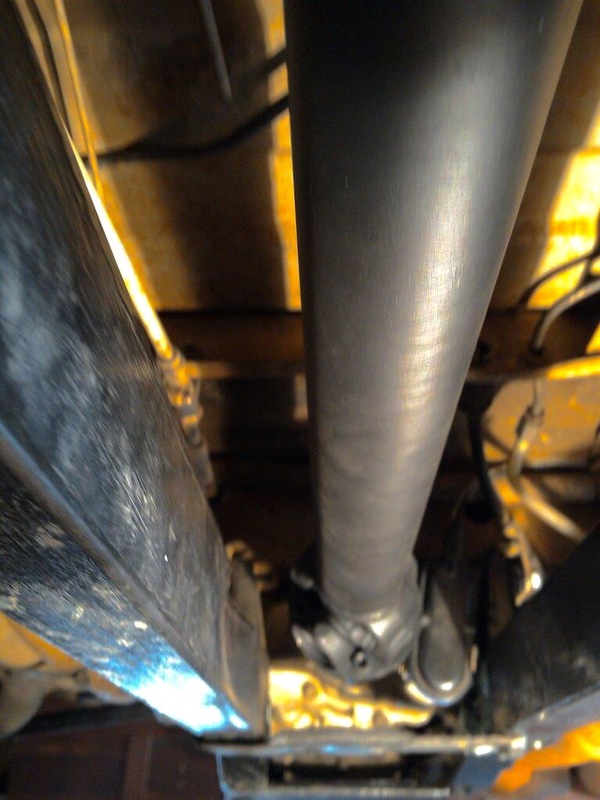 I think you might spot that washer in the pic of the sway bar install. I’m happy with these drop links, maybe not in the same league as Burley Motorsport’s, but ok for an amateur. 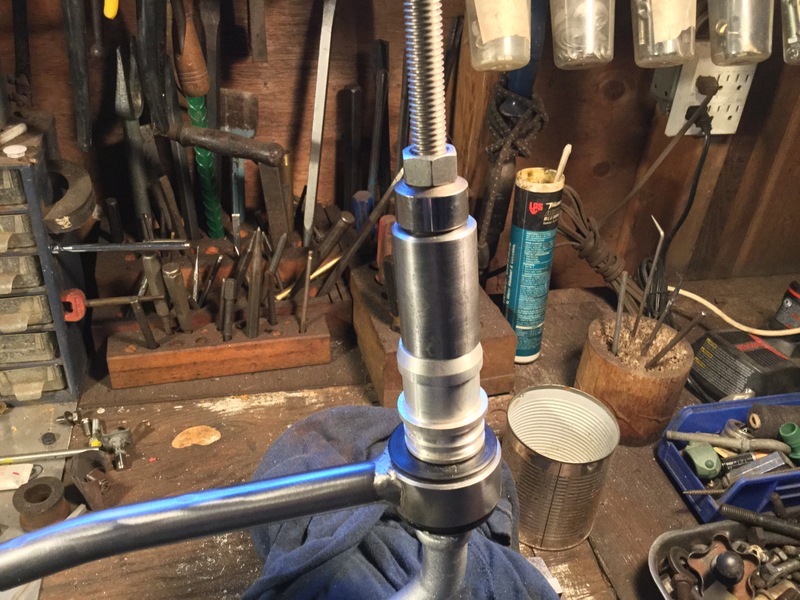 And another thing, with the bolt welded to the bar it is possible to make some little adapter so one could use a puller to remove the drop link from the bar easily. Ok, that’s a pretty weak advantage of this modification but I’m trying to find other reasons to account for the time and effort. 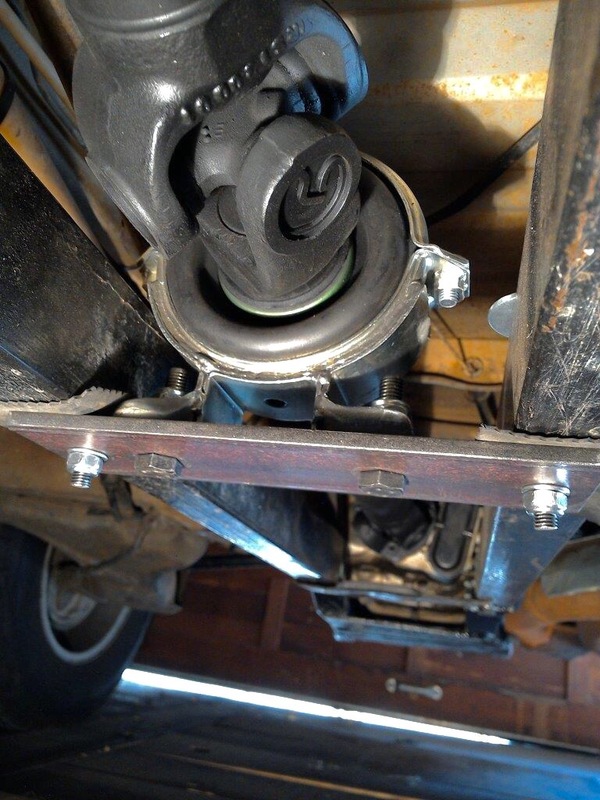 About a month ago i replaced a few bushings on the front suspension of my ’86 syncro. 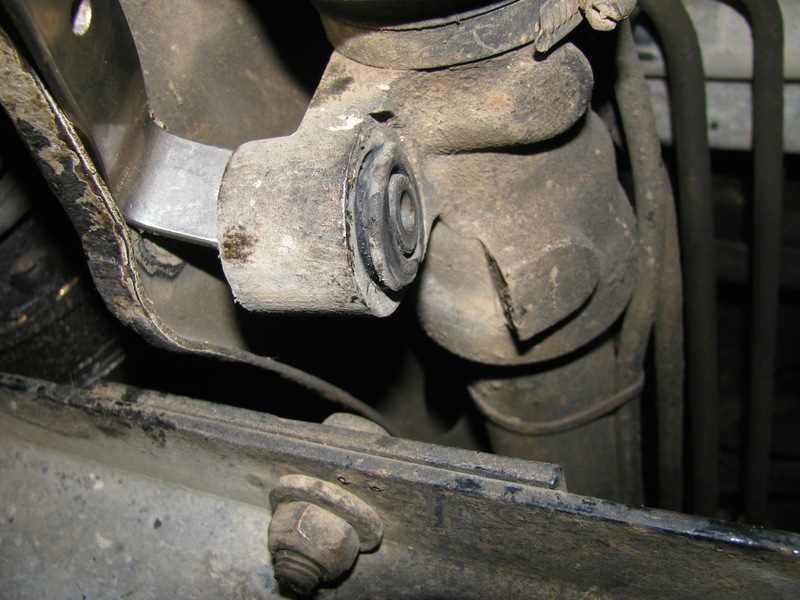 They were they sway bar to body bushings, the sway bar drop link to control arm bushings, and the steering rack bushings. 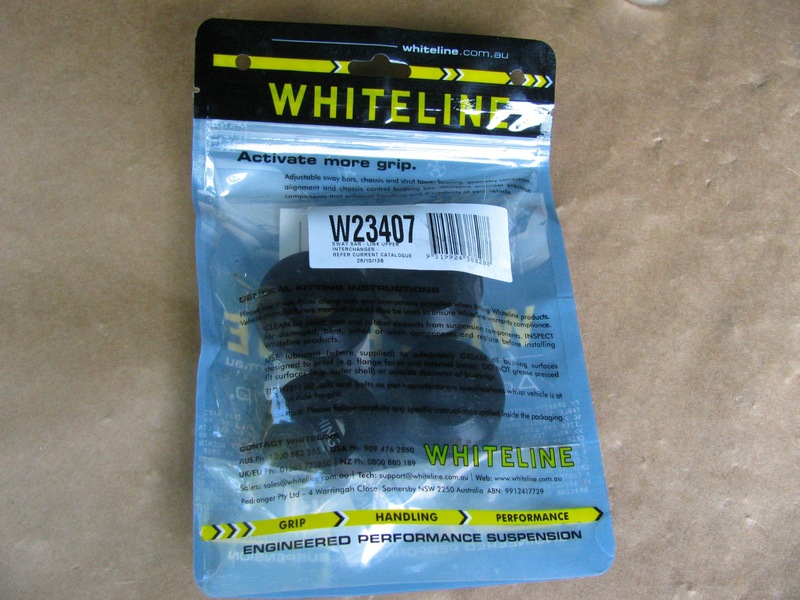 I replaced them with Whiteline polyurethane bushing from Chris at T3 Technique. I can whole heartedly endorse Chris for his great customer service and products. 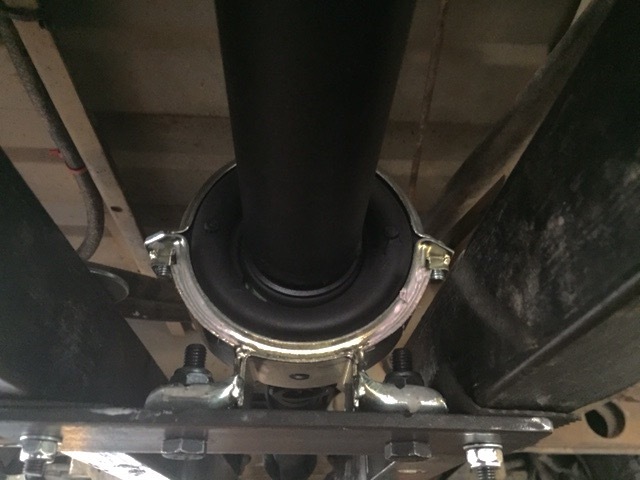 So first the easiest, the sway bar to body mount bushings. 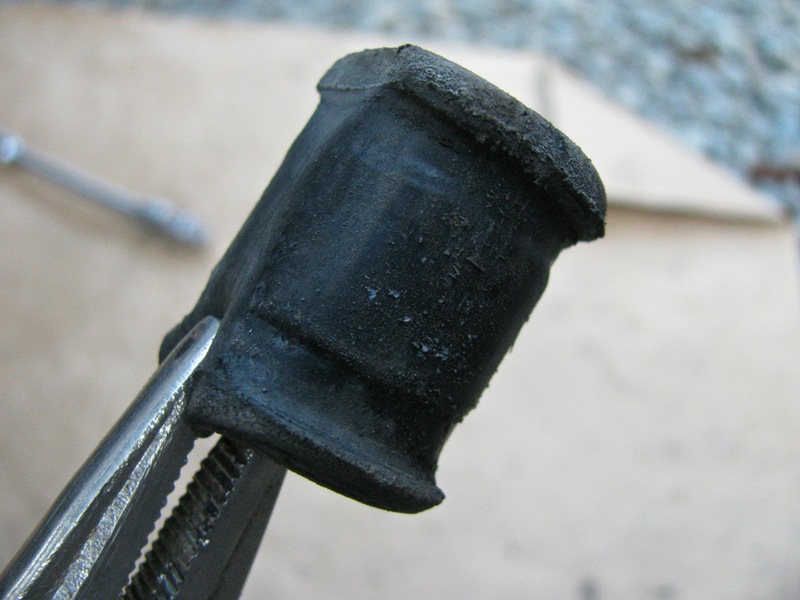 Here is a pic of the one of the original rubber bushings. A couple of 13 mm head nuts and bolts and the mounting bracket comes off. Note the spacer used in the syncro bracket. 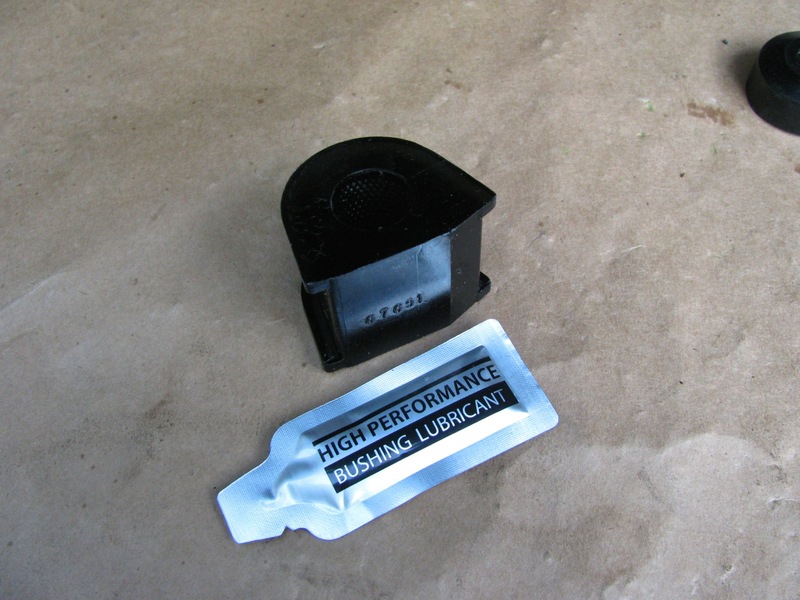 New bushing comes in pairs, and with a sachet of grease. 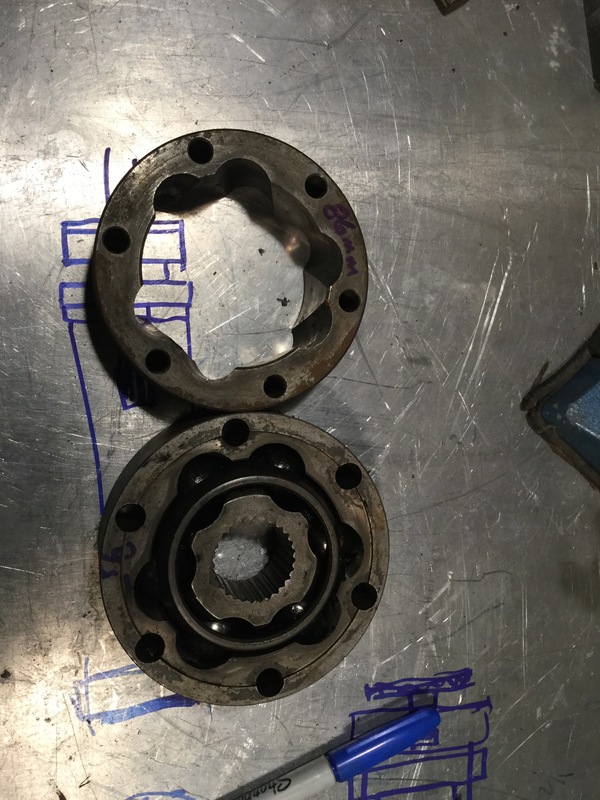 Grease is important in polyU bushings. They do have a reputation that they squeak, so you must grease them up with s low wash out grease. T3 techniques sells a couple of greases, and I bought one of them, Accrolube. 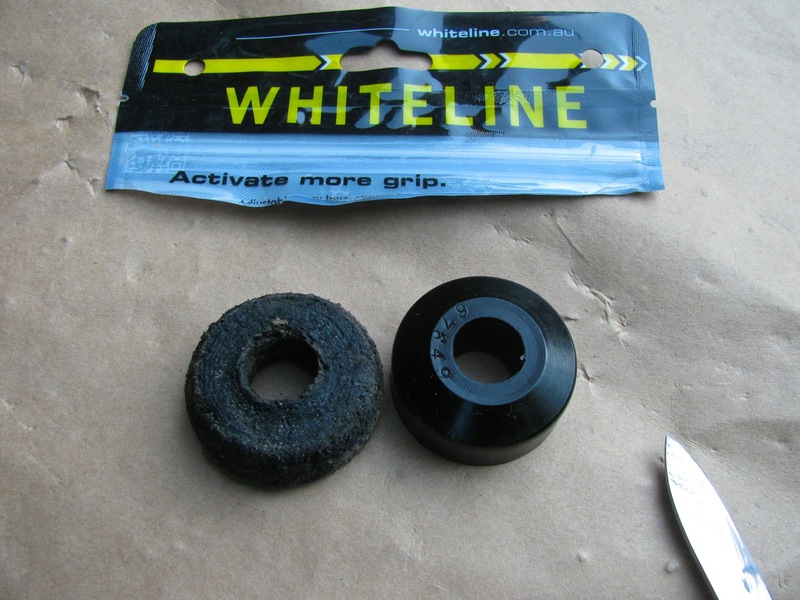 I didn’t know when i ordered that the Whiteline bushing come with their own grease. So you might see in the pics that i have used both the black grease from Whiteline, and the blue Accrolube. 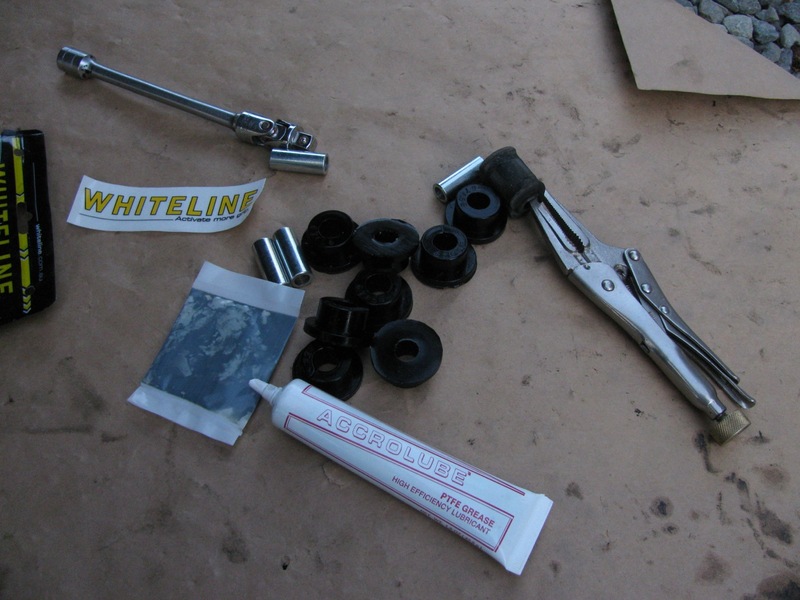 Note that the Whiteline package has instructions on where to apply the grease, important for bushings that undergo twisting motions. The homemade sleeve is holding up fine. 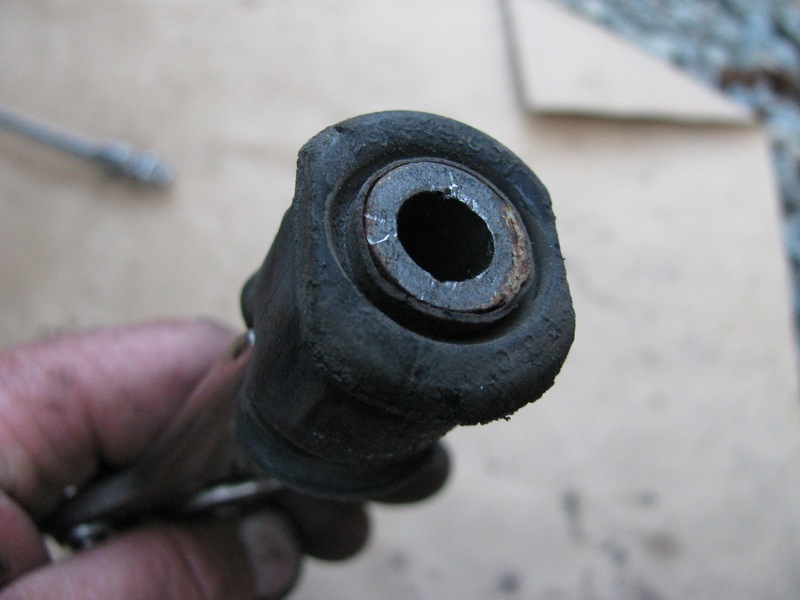 Interesting grease residue marks in the middle, showing the edges of the bushings? 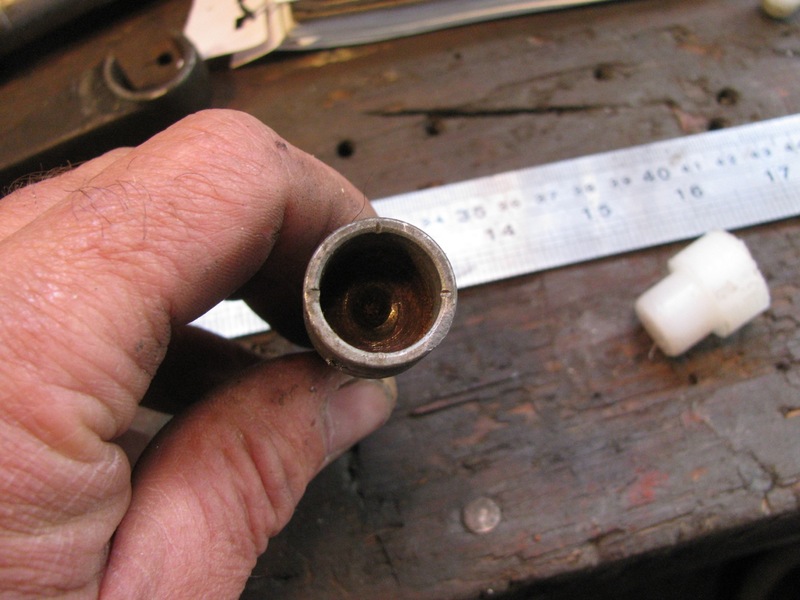 also note the shape of the new bushing. It is flat one one side, domed on the other. 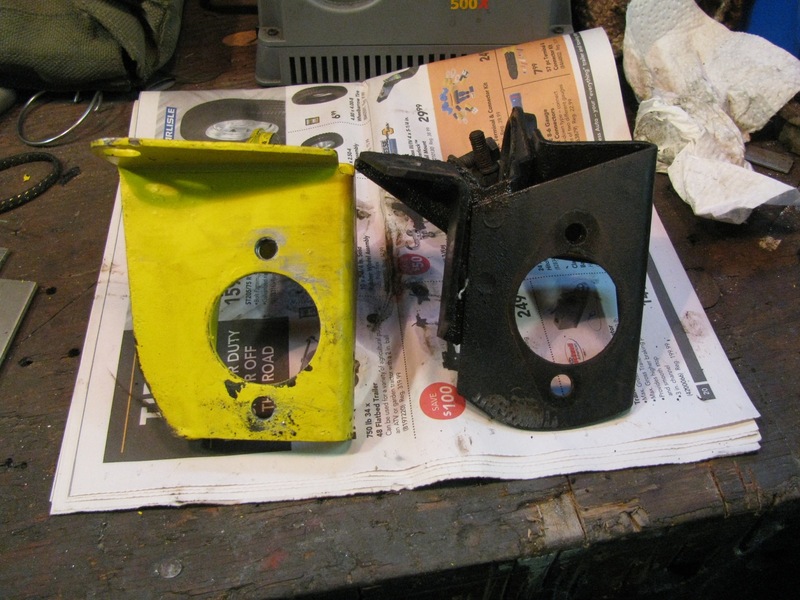 The domed side goes into the control arm recess, the flat side faces the dished washer. The flat side really should be slightly domed or at least bevelled, I think. Chris agrees. 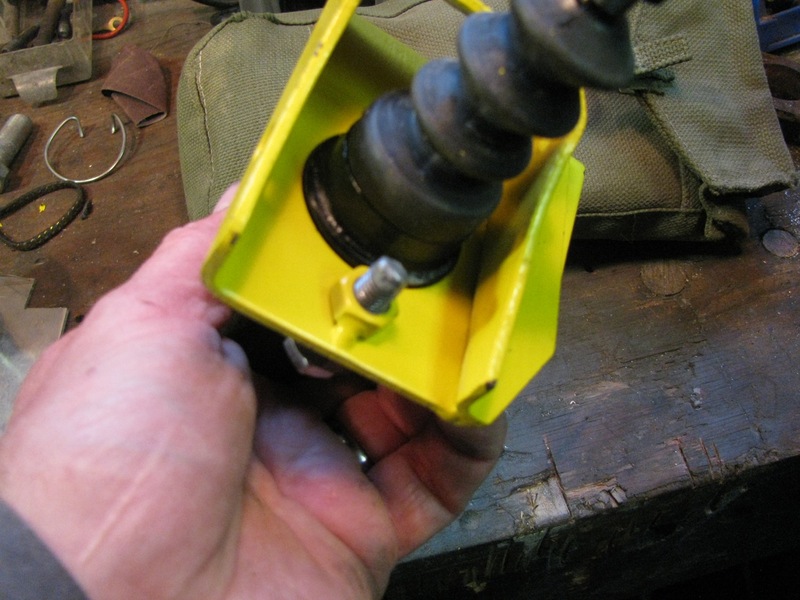 I modified the bushings on the other side, ground a bevel on them, but of course didn’t take a pic. I think the bevel roughly matching the curve of the dished washer would allow a little more articulation in the joint. 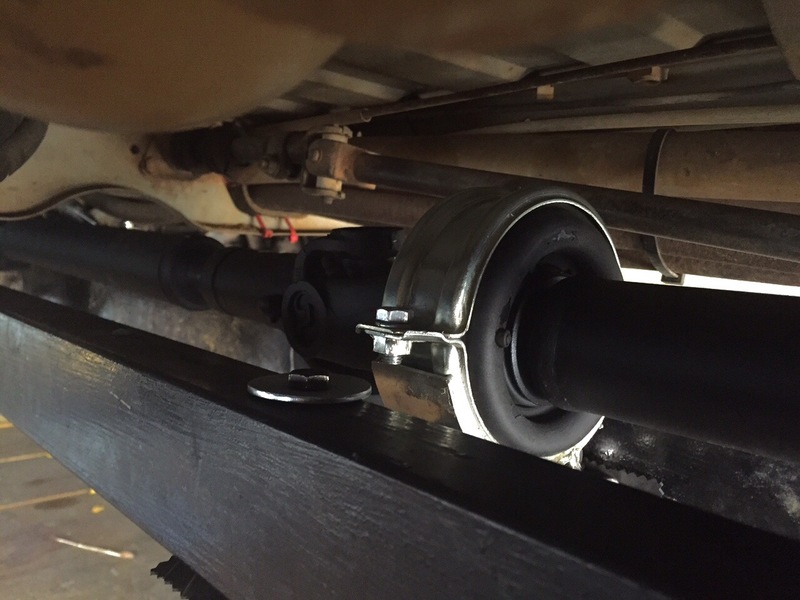 Now the install of the new bushings. 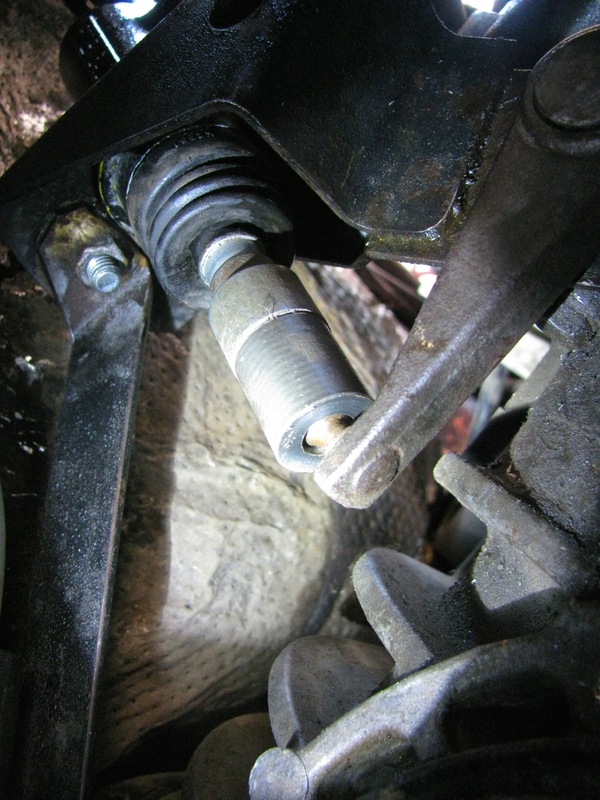 Dished washer on the drop link first, convex side facing bushing, then a bushing with sleeve installed in it and the drop link inserted in the control arm. 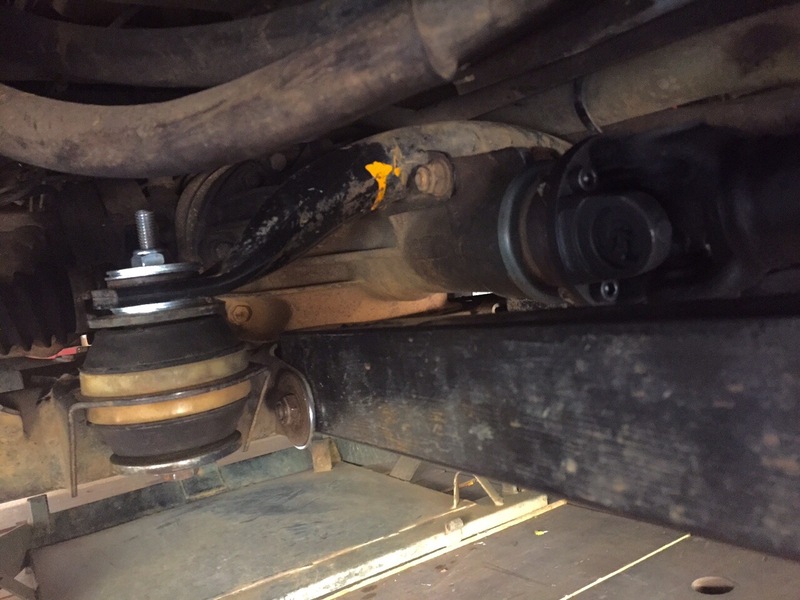 van lowered off the blocks so the drop link is pushed in the control arm. 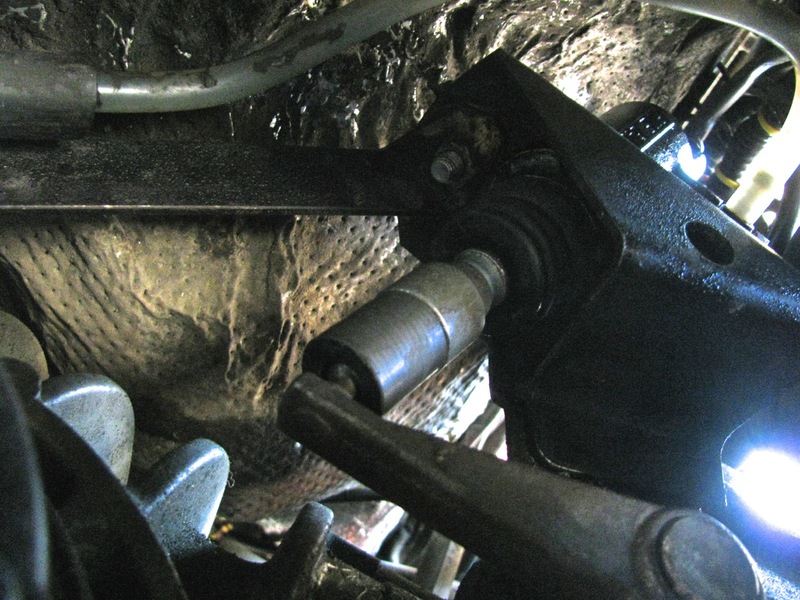 but the new bushing is tight and not much of the other end sticks out. 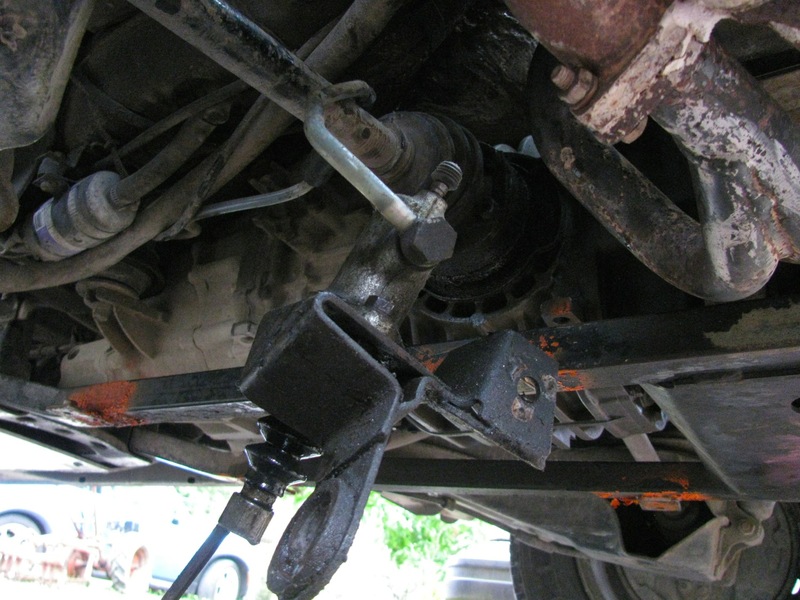 So even with van fully lowered, wheel on the ground, not enough drop link is exposed to get the other bushing installed. So i rigged up a ratchet strap and pulled the drop link down. 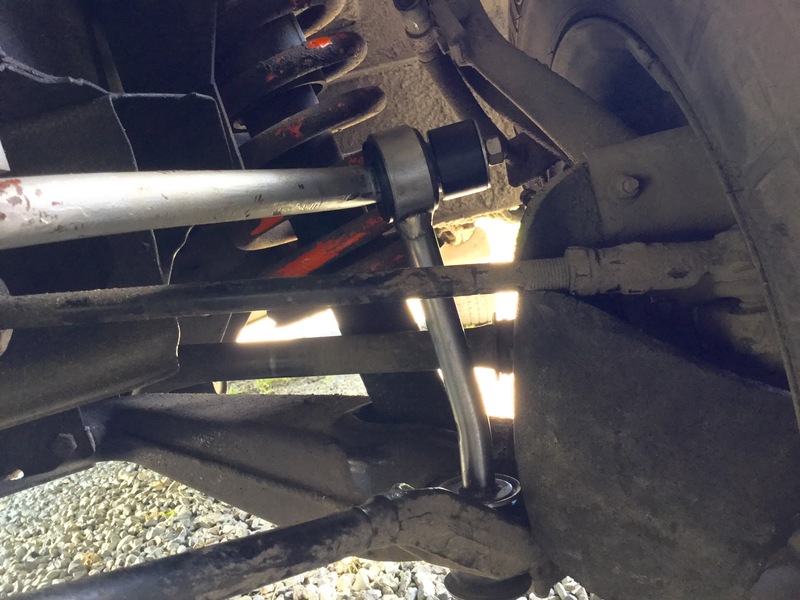 Also disconnected the sway bar to body bracket. 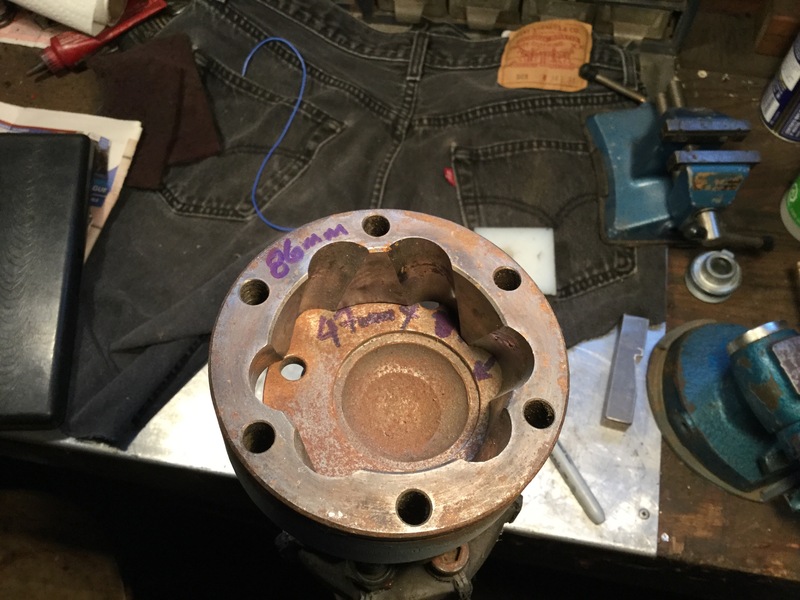 Even then it was a bear to get the lower bushing installed. 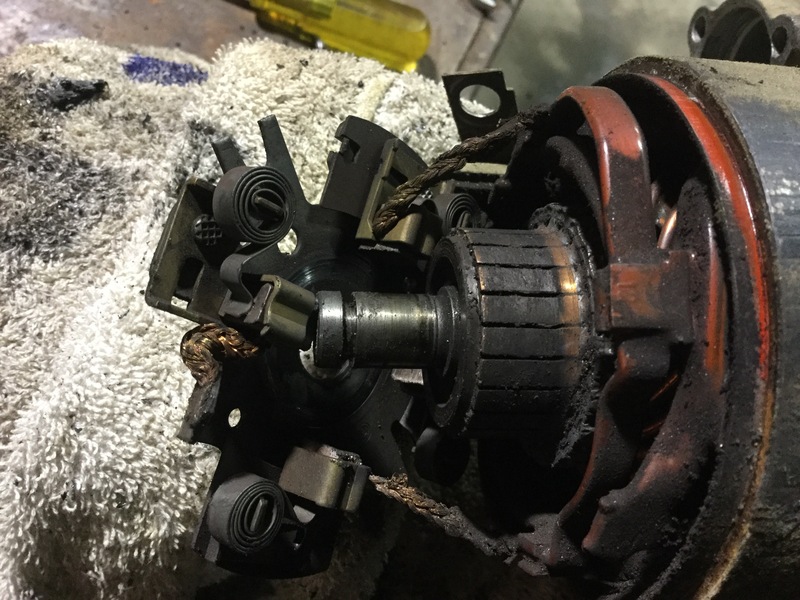 I certainly couldn’t get my dished washer installed so I pulled the bushing in as tight i could with a plain flat washer and the nut. I would do the nut up tight then remove it, put on the dished washer and try the nut…. just wouldn’t catch the threads. My home made stainless washer was too thick. 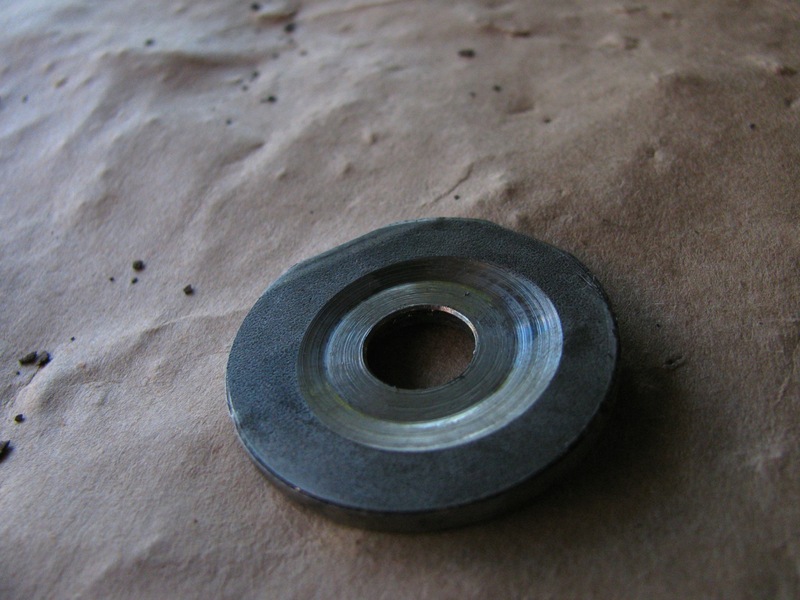 So i turned a recess in the washer and after a bit of a struggle and a lot of cursing, i got the washer and nut on. 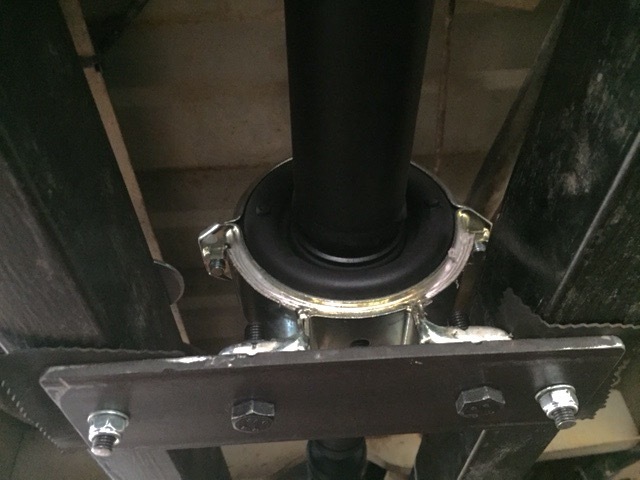 The other side was a tad easier with the modified bushing. But this part of the job took me a couple of hours. 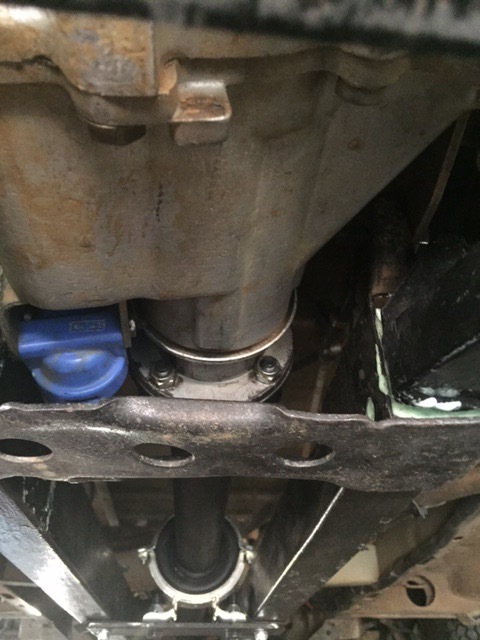 Now on to the steering rack bushings. There are four of them, upper and lower, left and right. Here you can see the lower on the right hand side. 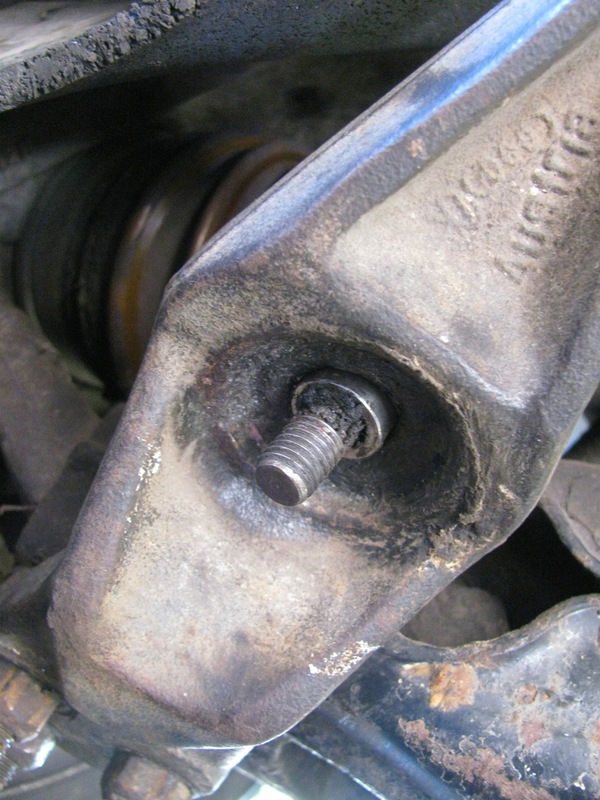 The bolt goes throughout the bushing and frame member and there is a stover type nut on the end. 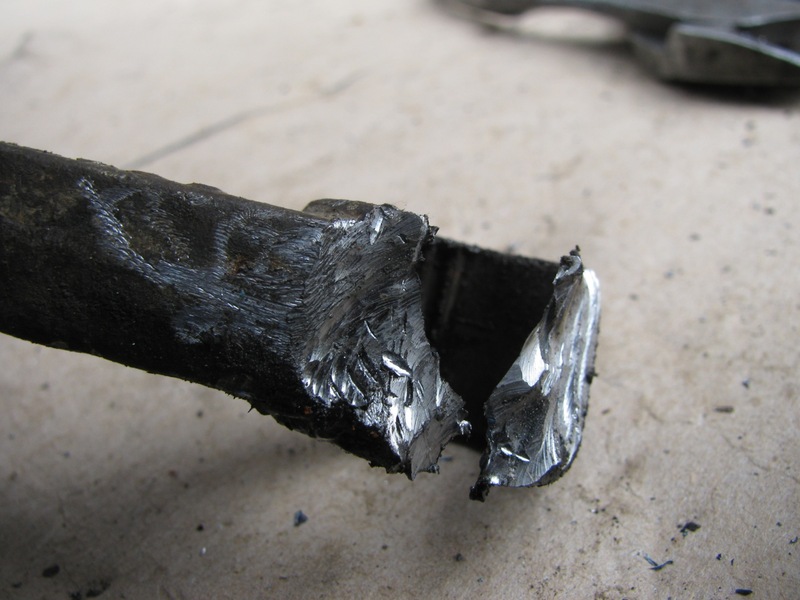 I would advise you to soak the nut side with penetrating oil a couple of days before you do this job, there is a fair bit of exposed thread on the bolt and they can be rusty. I started by loosening all four bolts, but not all the way. 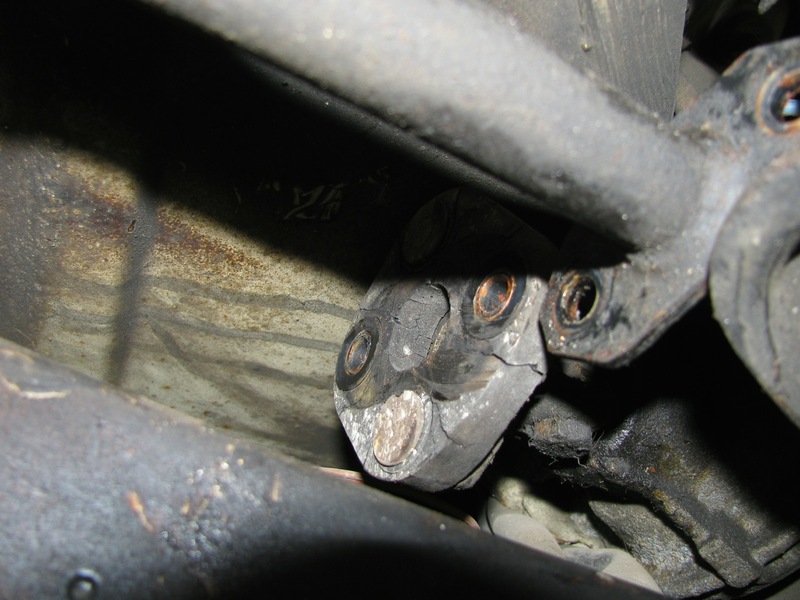 Then had at the lower left side bushing. 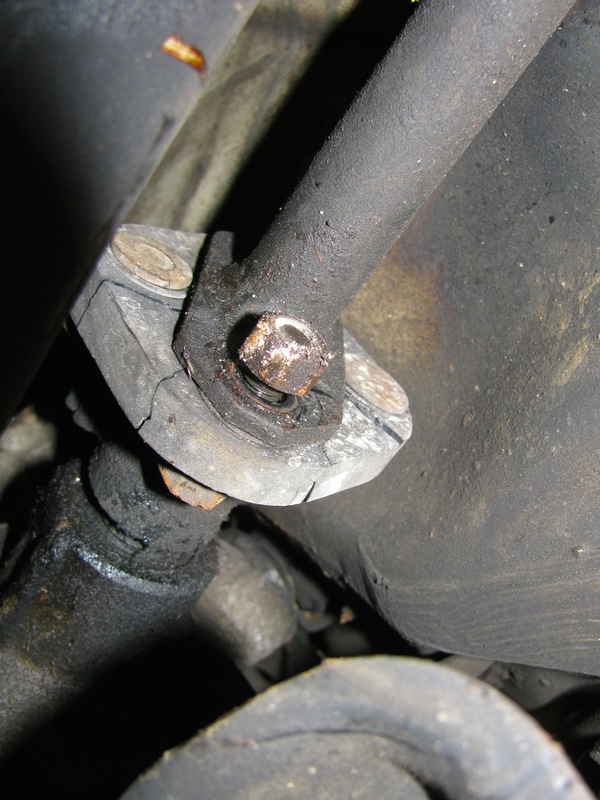 I removed that bolt, oh careful, there is s slim washer under the nut. 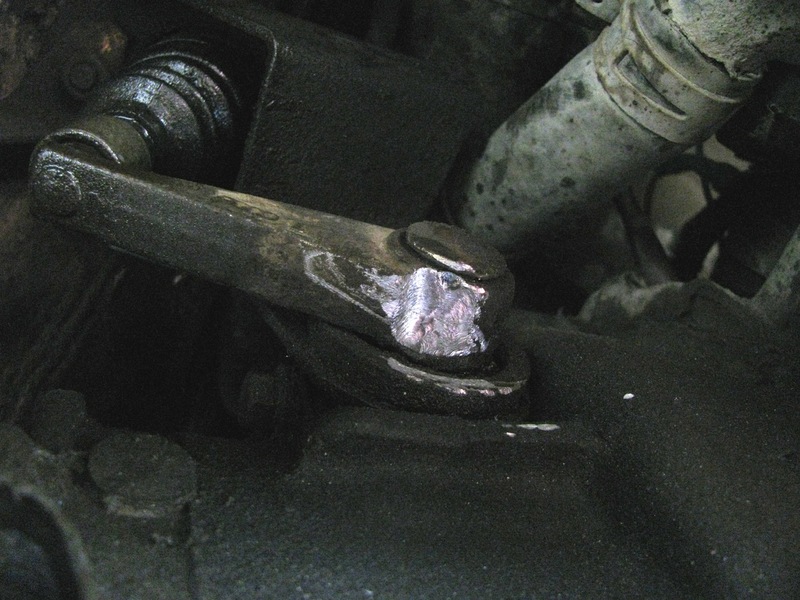 The with a slim small pry bar i pushed the bushing out from behind. Remarkably it came out quite easily. 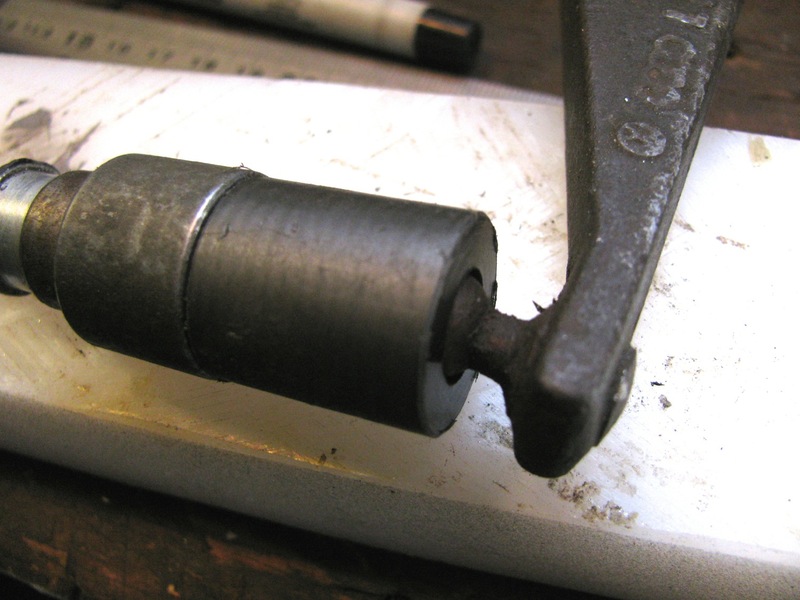 On a couple i grabbed the bushing with needle nosed vice grips to ease its passage. They seem to be in pretty good shape. 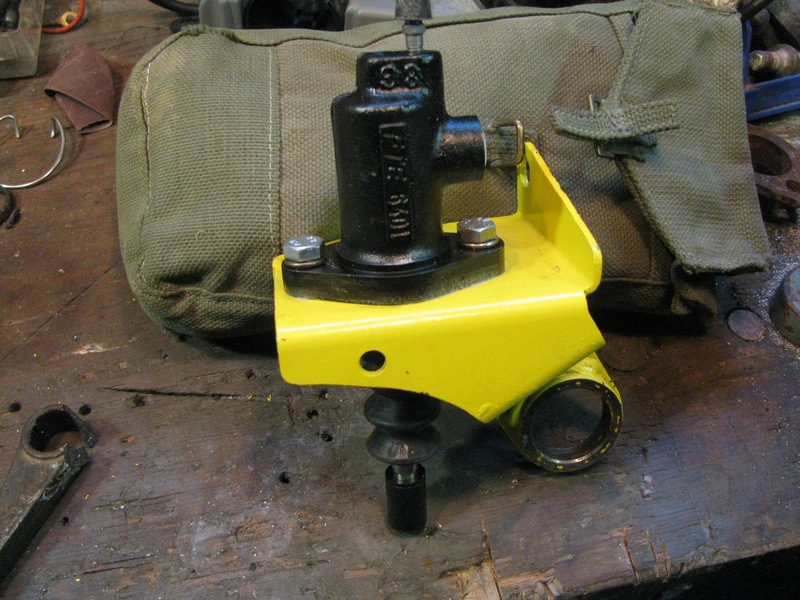 The new bushings are two piece with supplied sleeve. Pretty easy to install. I did one at a time but didn’t tighten up until all installed. Yeah, supervisor was checking in. 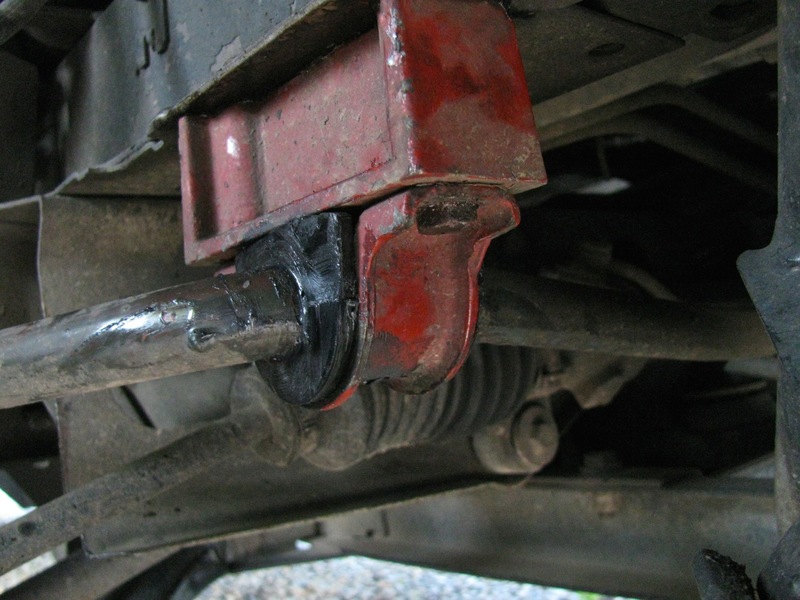 Now on the driver’s side the steering rod (from steering gear box to steering rack) prevents the steering rack from being pried forward enough to both pry out the old bushings and install the new bushings. 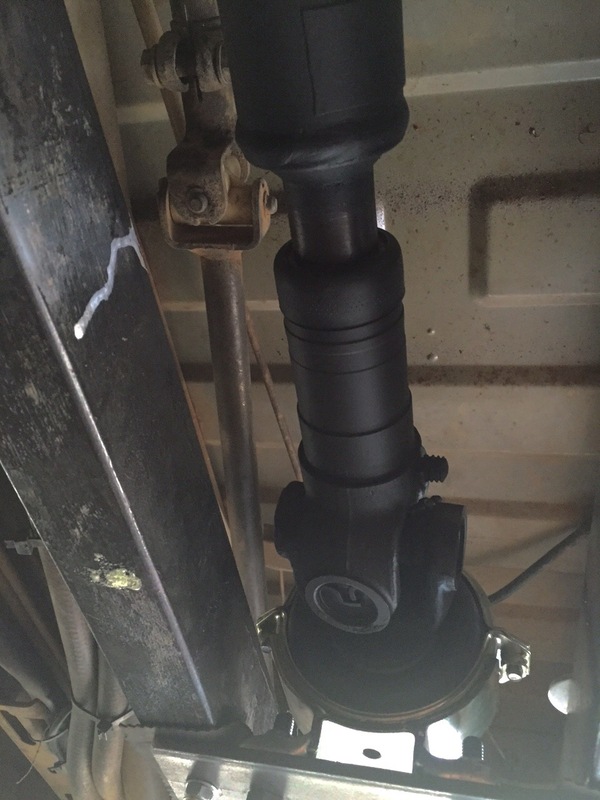 I disconnected the coupling at the forward end of the rod and loosened the slimed coupling at the u-joint in the rod. 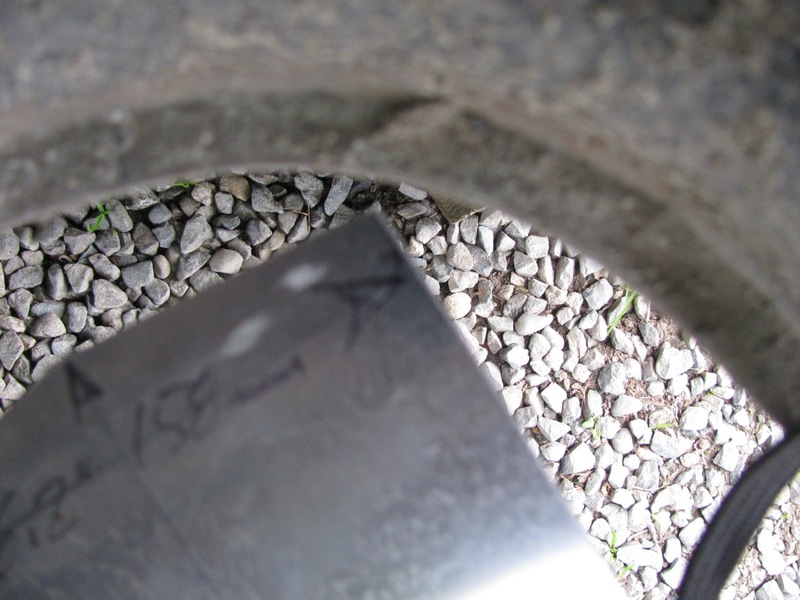 It was only later, looking at the pics did I notice the cracks in the rubber coupling, sheesh, another thing to replace. 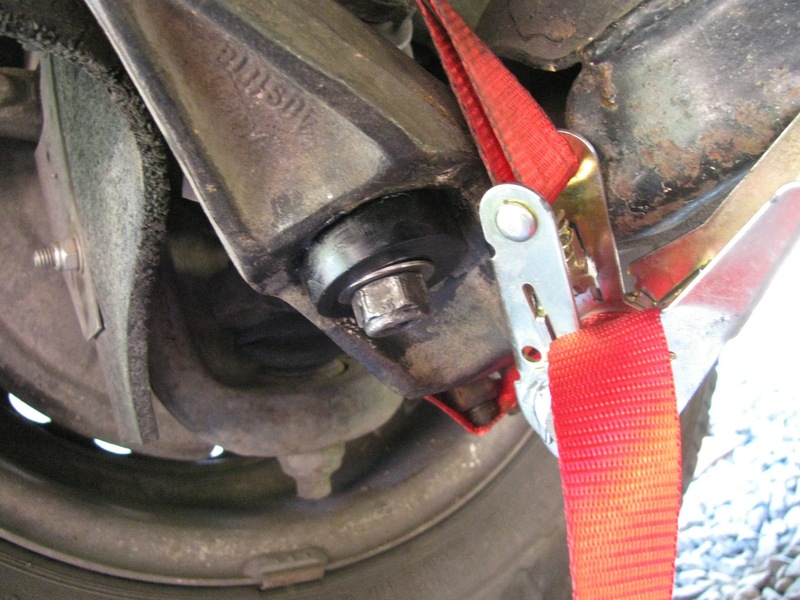 Wrench access on the driver’s side is a bit restricted, so it take a little longer. 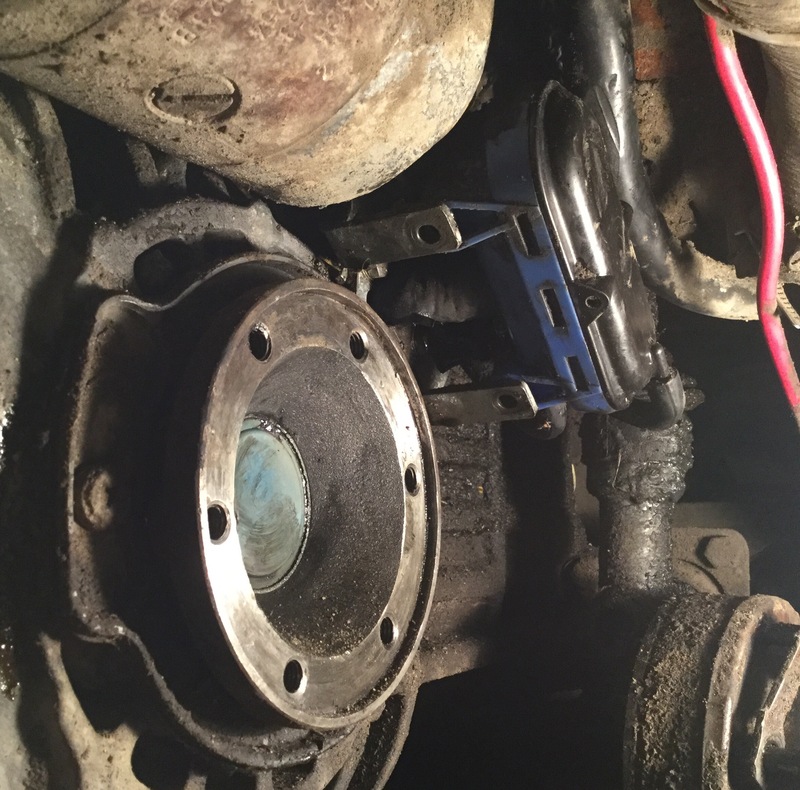 But these bushing took less time to install than the drop link bushings. So the verdict? I could really notice the steering response improvement, especially at highway speeds. 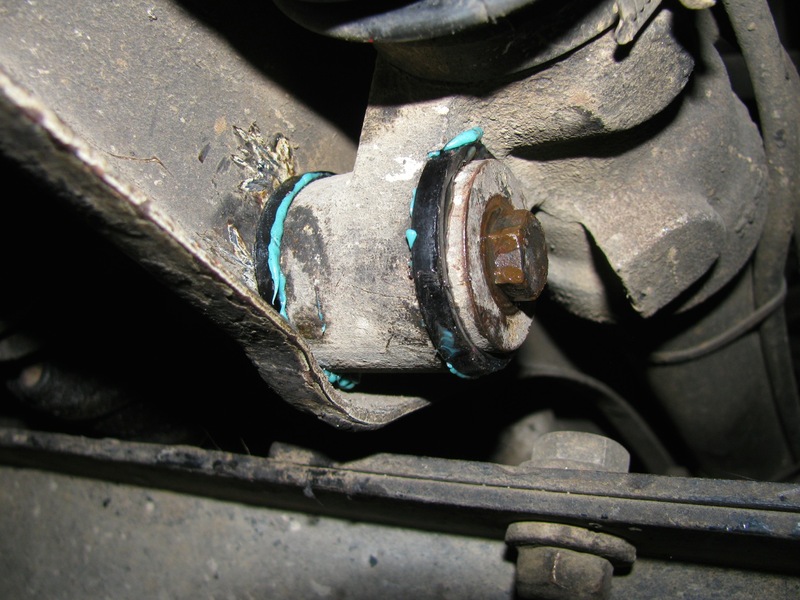 I’d recommend the rack bushings even if your existing bushings are in good shape. Too long i have suffered the jibes from fellow syncro owners about the teeny stock wheels and tires I use. Finally I found some wheels that might let me join the real mens club. They aren’t my first choice but the size, price, and offset were all right. They are 15×7 Mercedes 15 hole alloys from an early ’90’s 380SL. 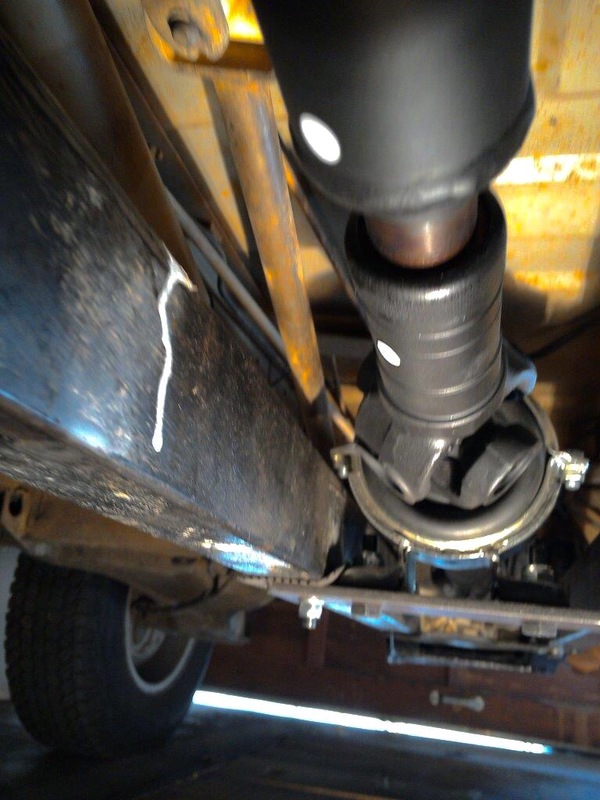 The offset is 25 which I kinda like, I wanted good clearance from tire to suspension components. Another good thing about these particular wheels is the thickness of the casting where the lug stud goes through. 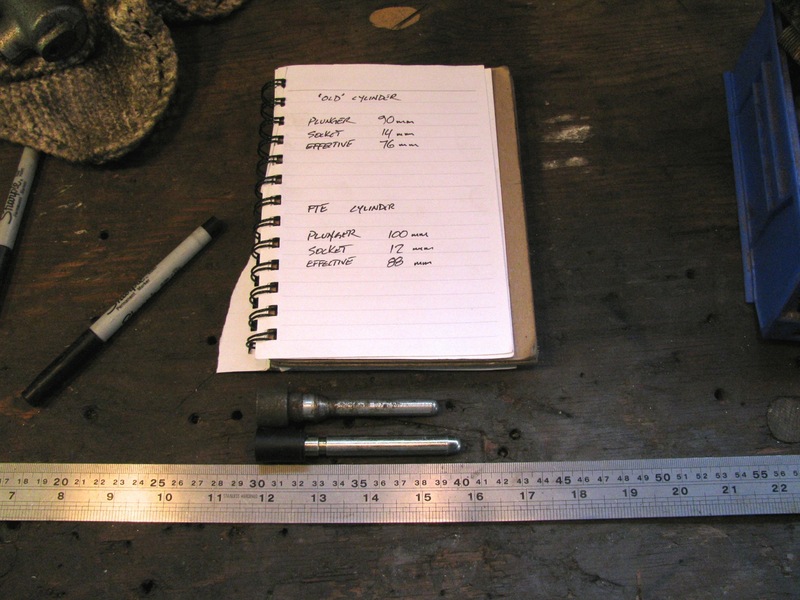 In this case it is only 11mm, some can be as thick as 44mm. 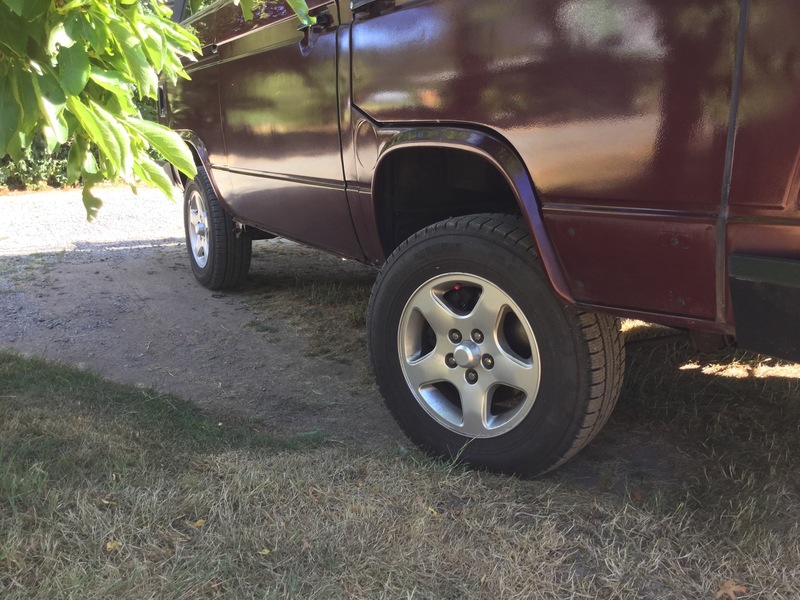 I would have to install longer studs for any wheel thicker than 11mm and that was something i did not want to do (its a pain to do the front studs on a syncro). This wheel thickness will come up later. Anyhoo, I’m not going to go into all the tire choices in this post. Im just going to show you what I did today to see if one particular tire would fit. The tire in question is a Yokohama Geolander GL AT-S 225/70 15. They have I think a load rating of 100, which is my, probably flexible, lower limit. Here’s one bolted up. I sanded this one a bit (they all need painting) to try out a primer. 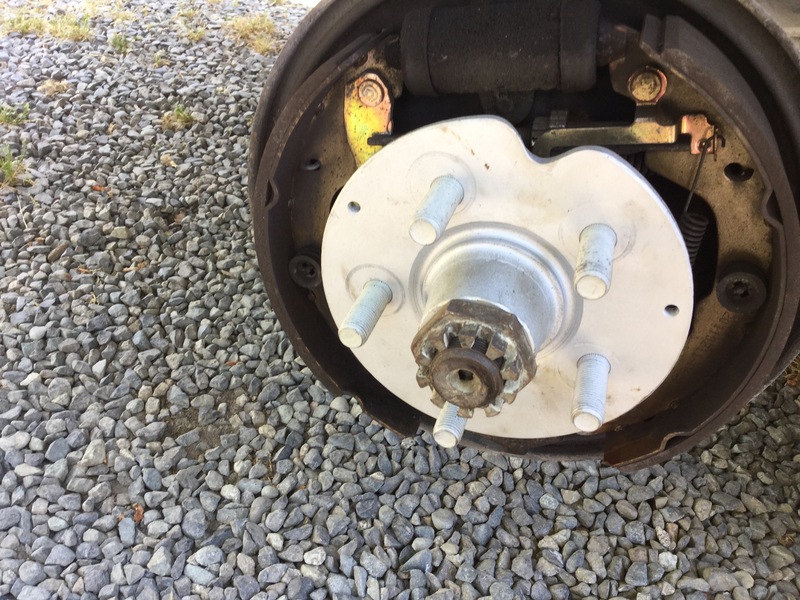 The wheels have to have the stud holes drilled out to fit on the 14mm Vanagon studs. 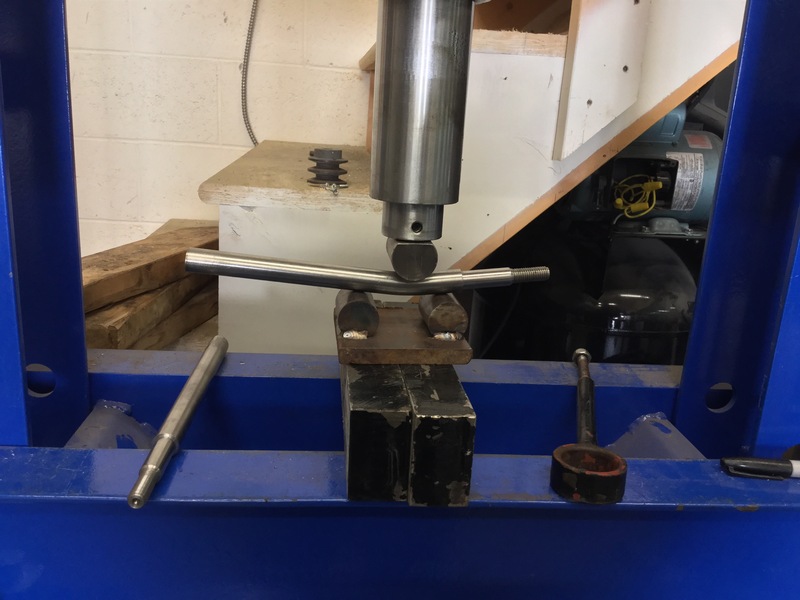 They were originally drilled to accept 12mm studs. You also have to get new lug nuts, the small seat ball type as opposed th the conical Vanagon variety. I got the hardware from T3 Techniques, and I also have received a lot of great advice from the owner Chris over the years. 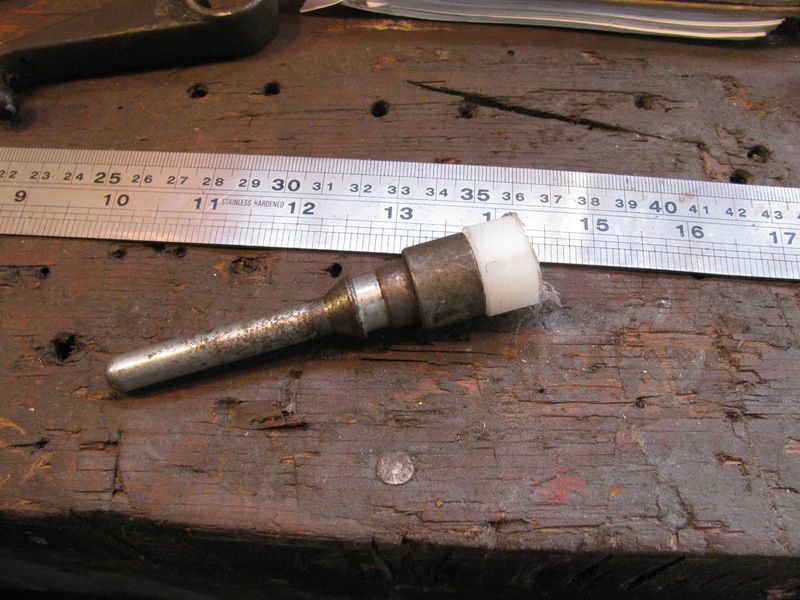 Here is the small ball seat lug nut from T3 Techniques. The trial fit was done on the rear wheel for a few reasons. 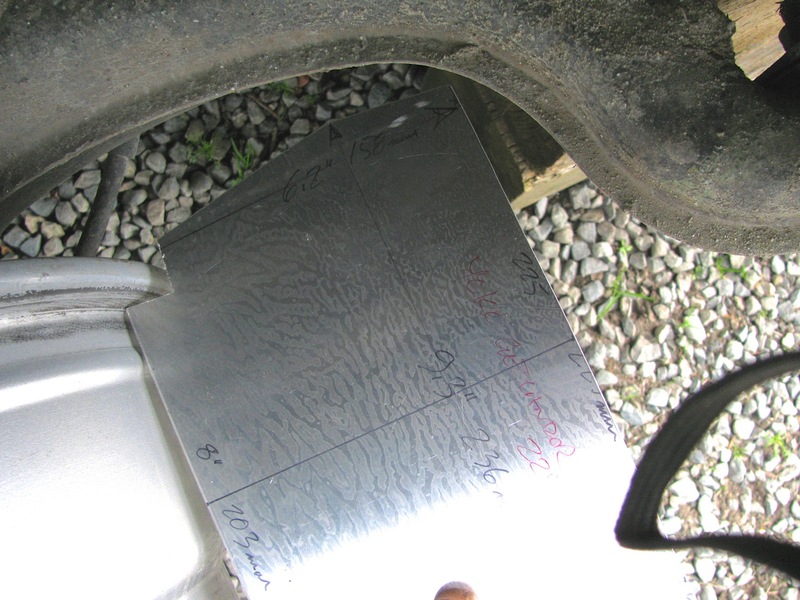 First, the rears have the shortest stud projection, just flush with the stock steel wheels. With the alloys I got about 6.5 turns of the nut to hand tight. 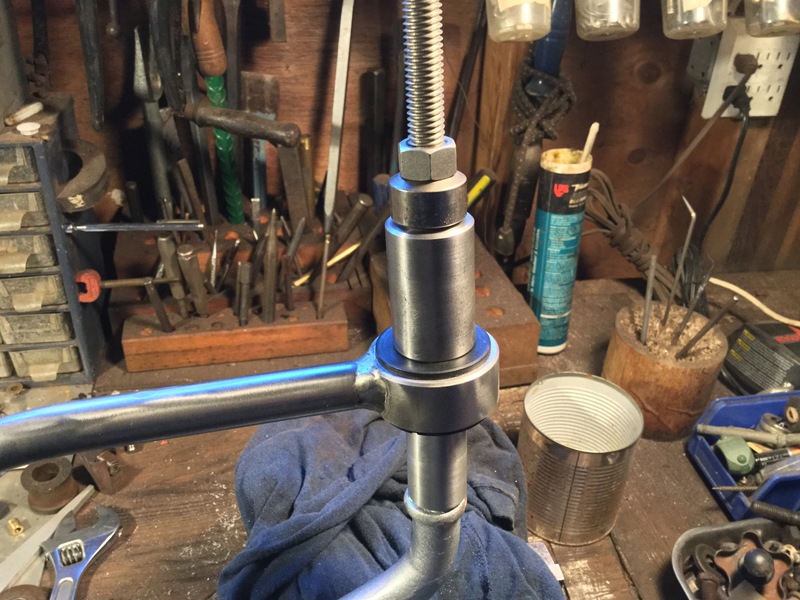 Now with the thread pitch being 14X1.5 mm that means the nut goes on 9.75mm. I would have liked more, 14mm would be the same as with the steel wheels. I don’t know if this amount of thread engagement is not sufficient, anyone have any thoughts? edit: 9.3 turns would give me 14mm of thread engagement. That would be grand, but there is a German notice of requiring 6.4 turns minimum. So what to do? I am leaning towards longer studs for the rear. The front studs might be ok, there is a couple of threads exposed with the stock steel wheel, unlike the flush situation on the rears. 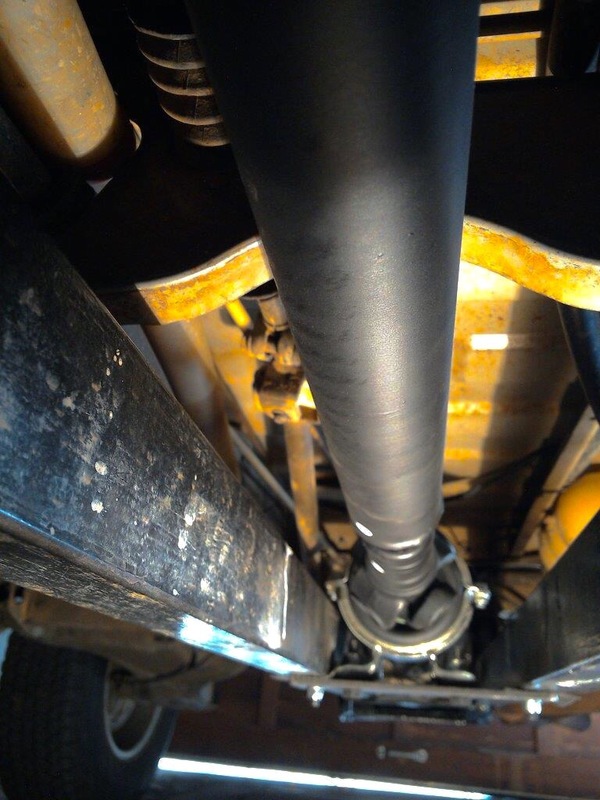 The second reason to check fitment on the rear wheels is to determine if rim and tire combo clears the trailing arm. I made a rough template of the tire profile from published data. What I am not 100% sure about is the sidewall height. I initially made the template so that the sidewall height was measured from the lip of the rim. 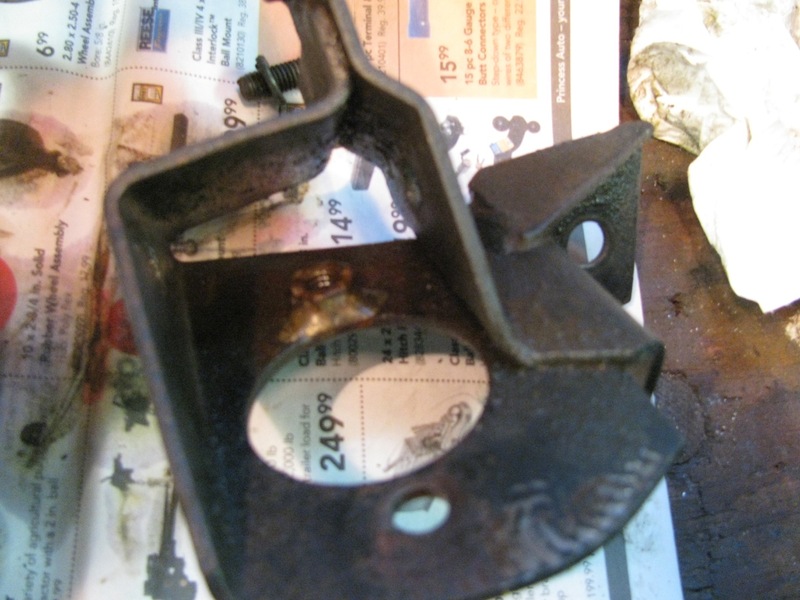 When i held the template up to the wheel it interfered quite a bit with the trial arm. I thought this strange as I am sure I have heard of this size tire fitting the stock trailing arm, even on rims with higher offset. So i trimmed the template so that the sidewall height includes the tire bead section. 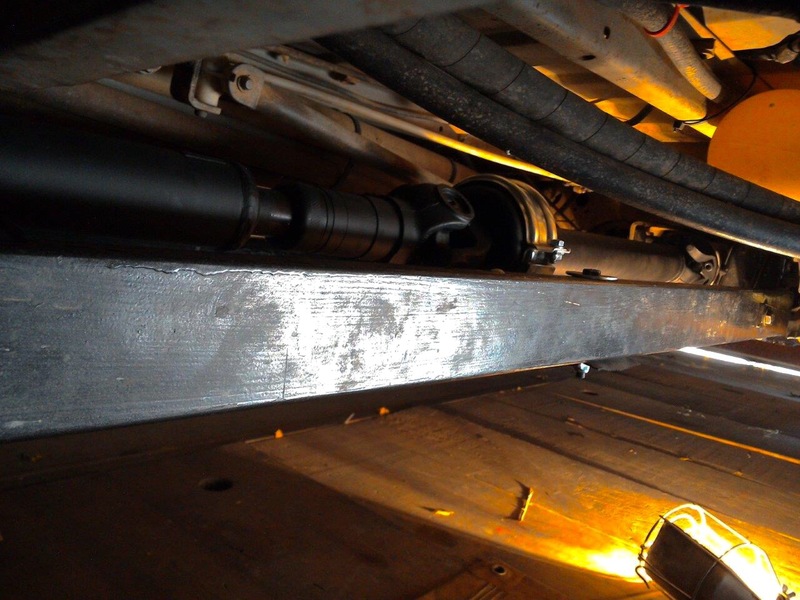 Not a great picture but you can see the notches I cut and you can see there is not only about 1/4″ of clearance between template and the pinch weld seam on the trailing arm. My template does not have radiuses corners so that might exaggerate things a bit. I don’t know if this close up illustrates the clearance any better. I’m reconsidering this tire size based on this quick and dirty measurement. The other worry is that with a wide tire and a 25 mm offset rim there might be interference with the sliding door. Well no worries there, it clears with about 10mm to spare (close to my paper calculation). I’m going to have to pour over the tire choices once more. Please, don’t mention Nokians, I know, I know. 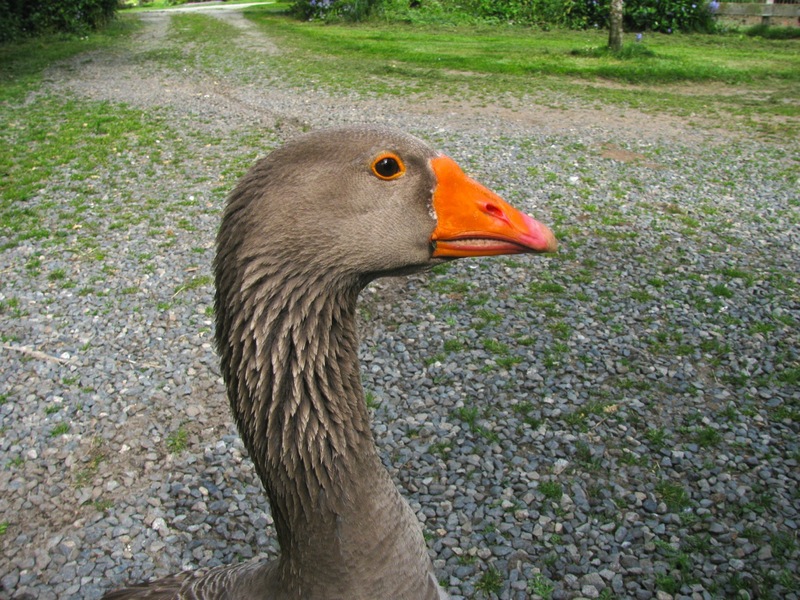 During all this my friend was giving me skeptical looks. 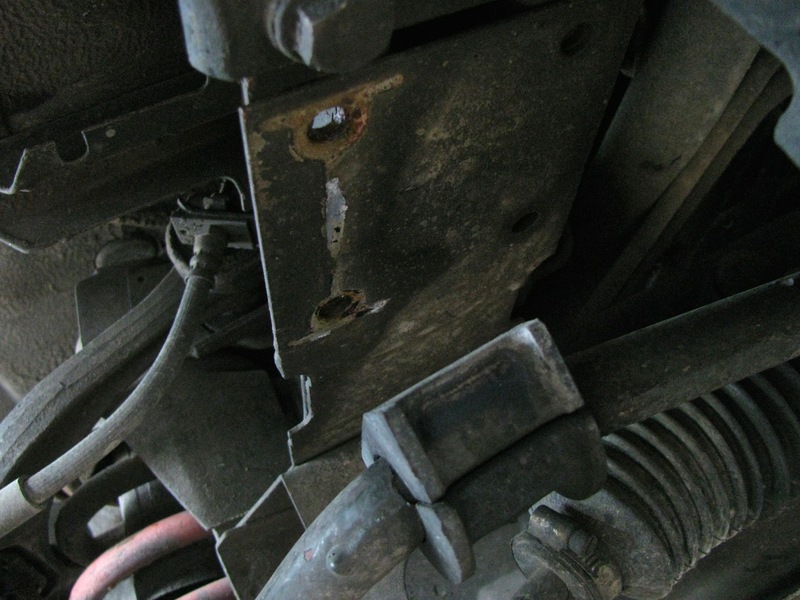 You are currently browsing the archives for the syncro specific repairs category.